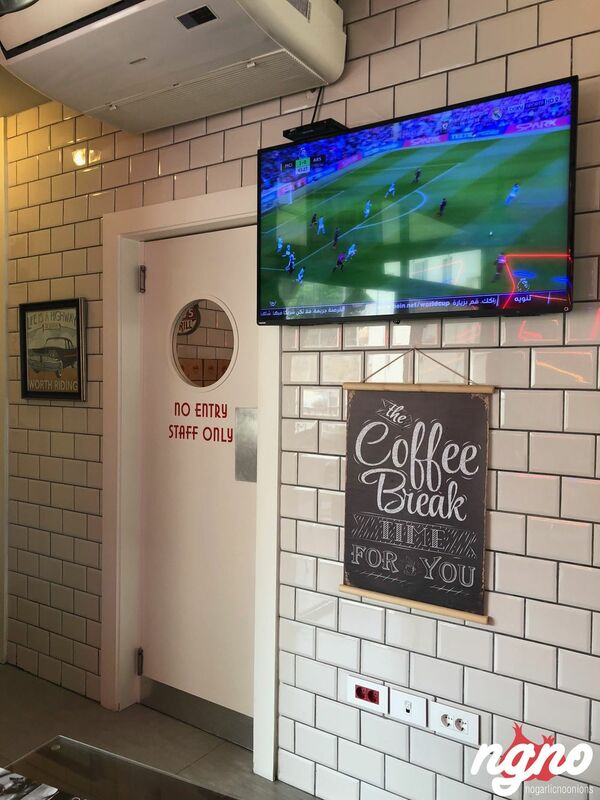 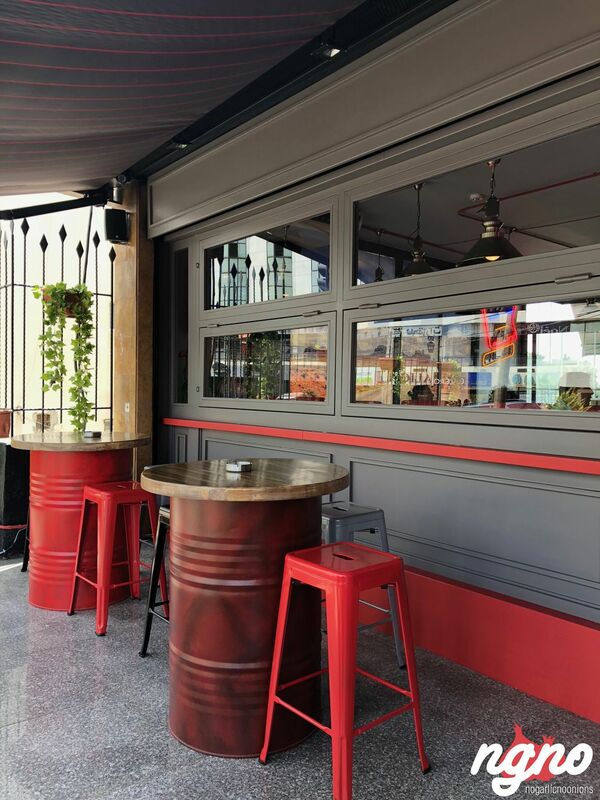 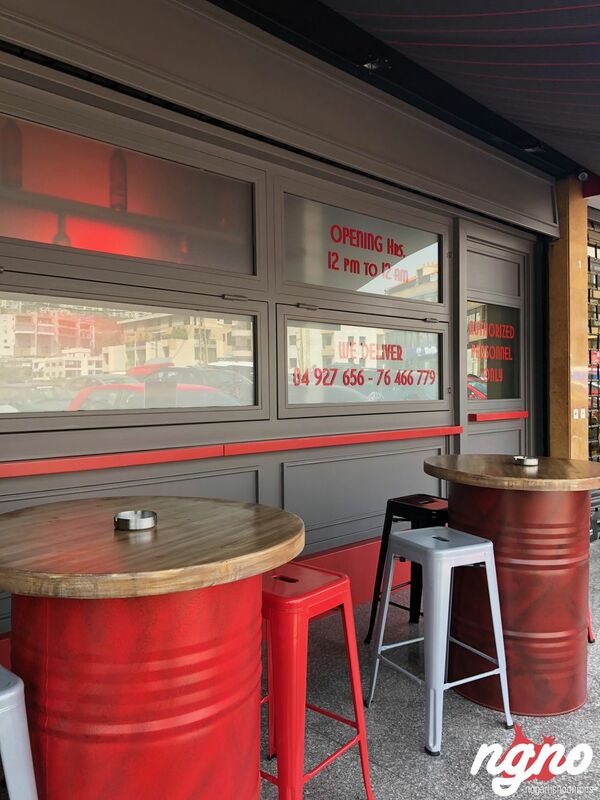 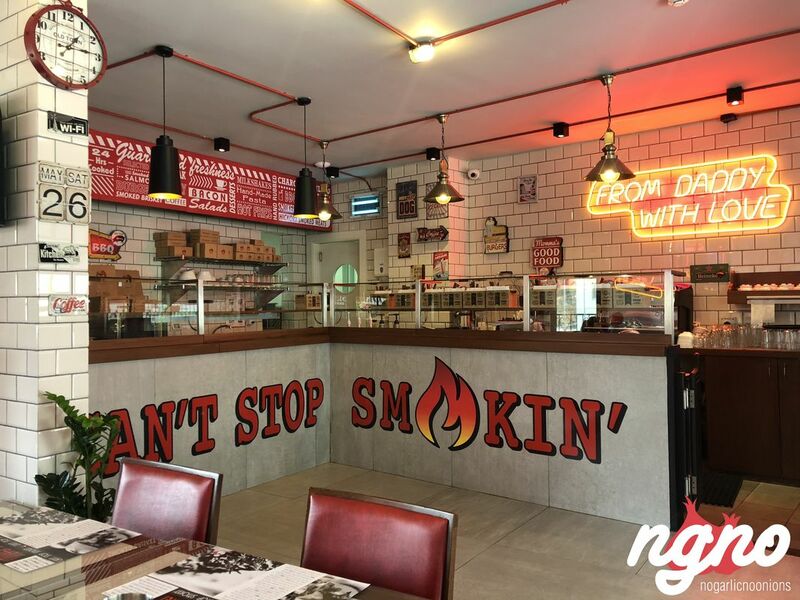 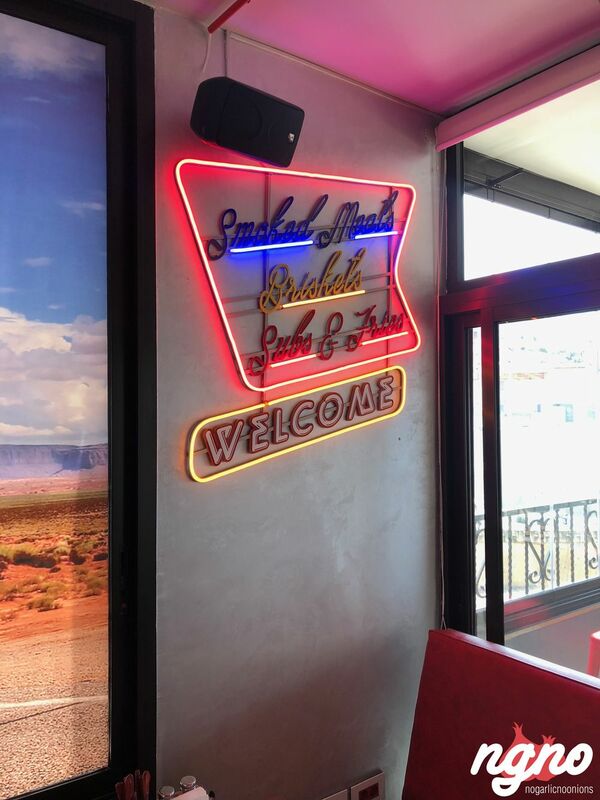 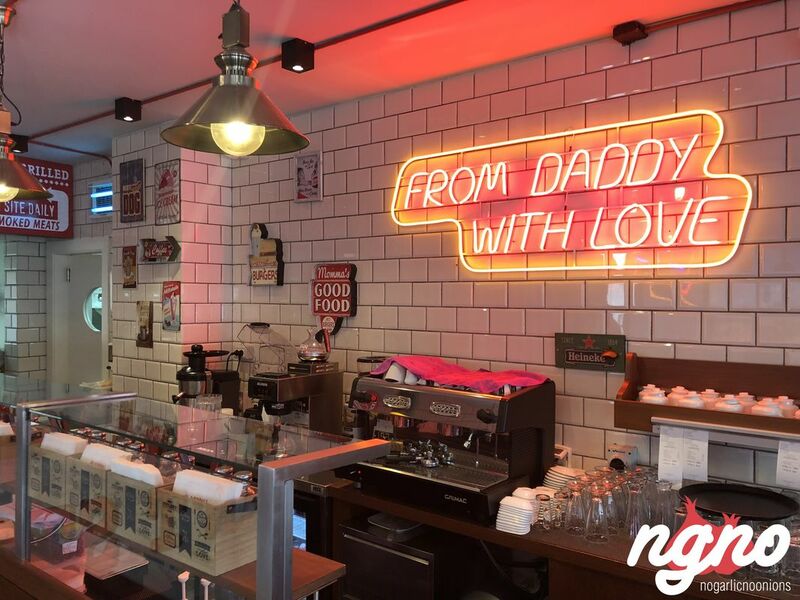 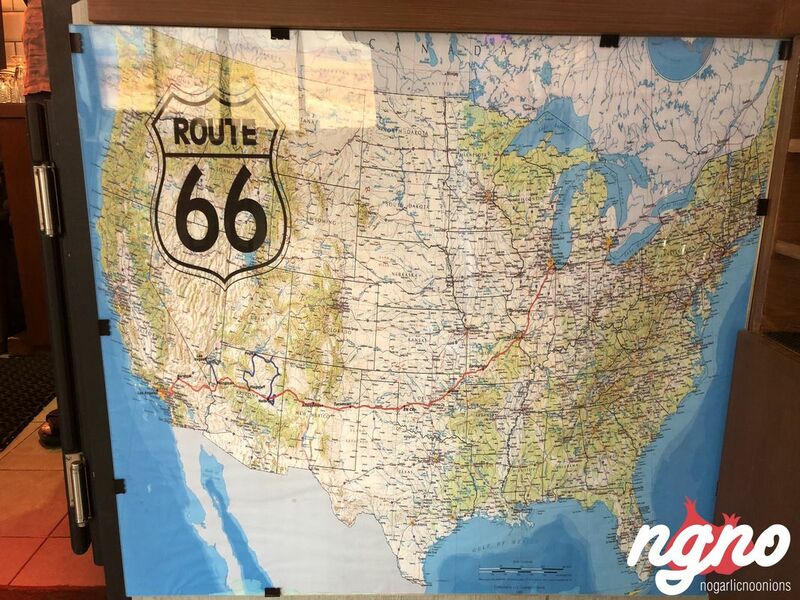 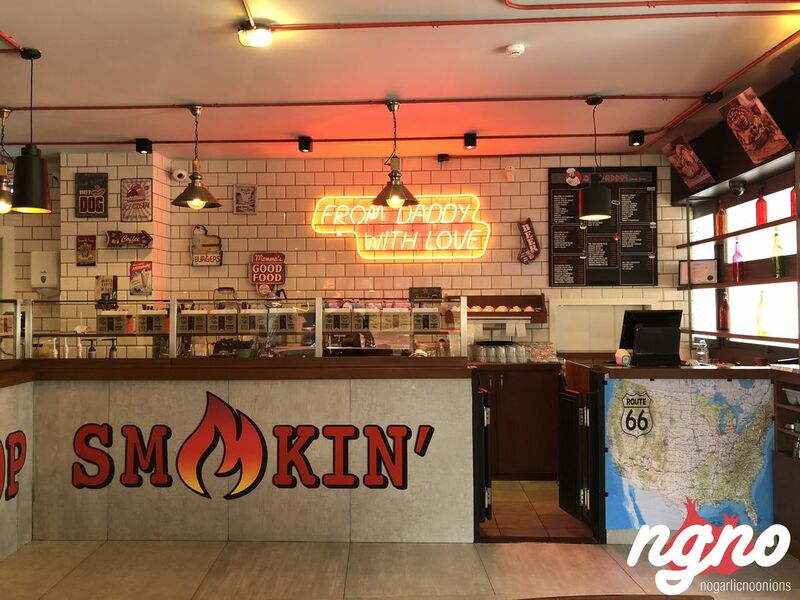 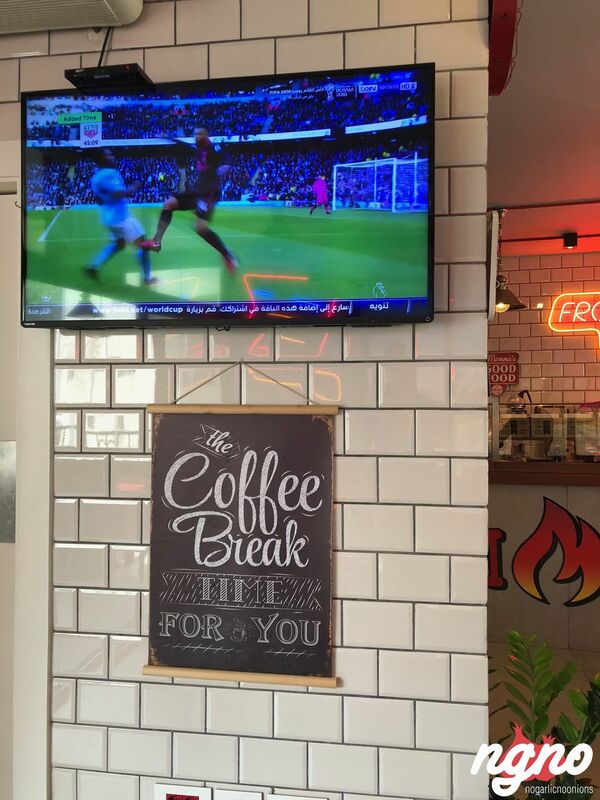 American all the way; American diner-inspired decor, Route 66 themed decorative items, white tiles, drinks and coffee stations, a bar and neon lights. 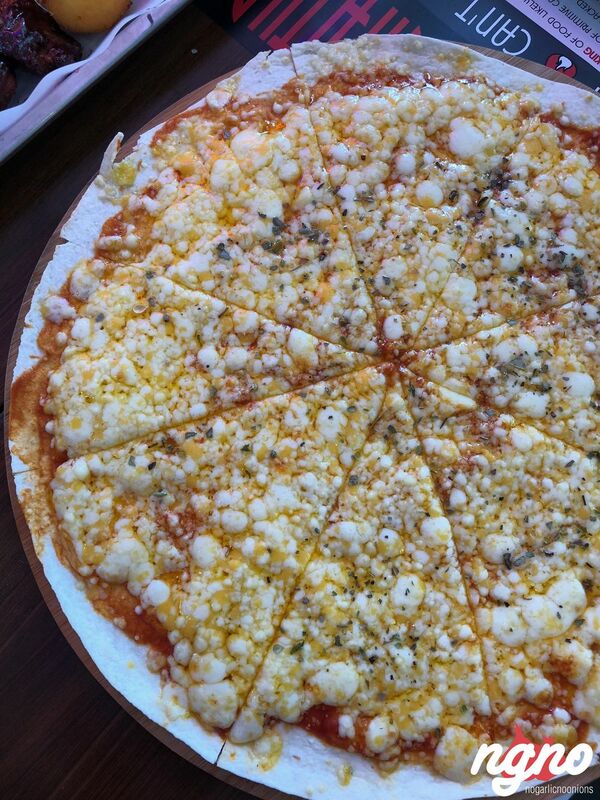 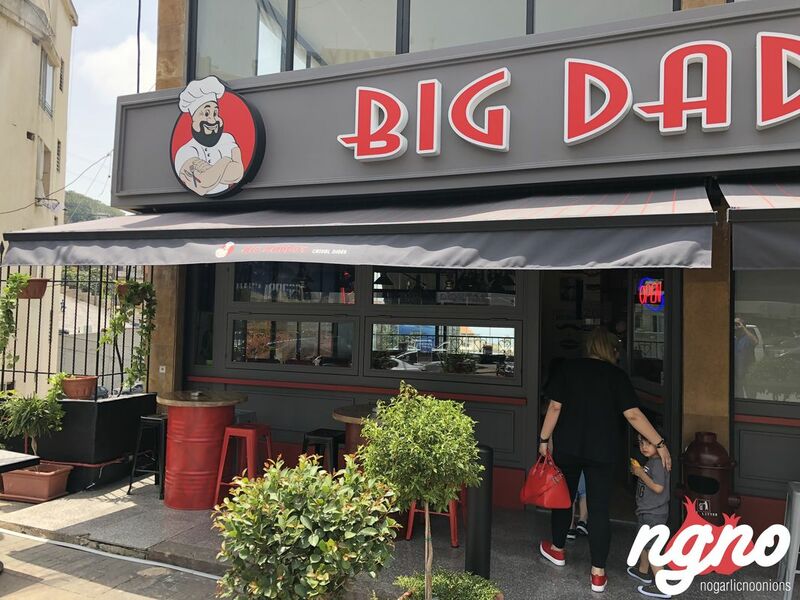 Big Daddy’s, the latest restaurant to open on Bickfaya’s main road in Mtayleb, is probably avant-gardiste for the area. 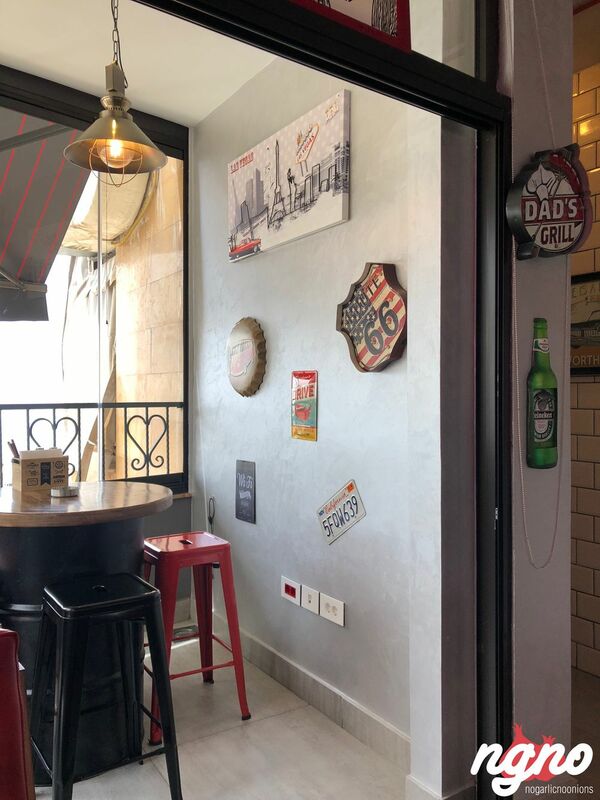 Occupying the “Baguette&Co” previous location, the American diner comes from behind the Atlantic with style. 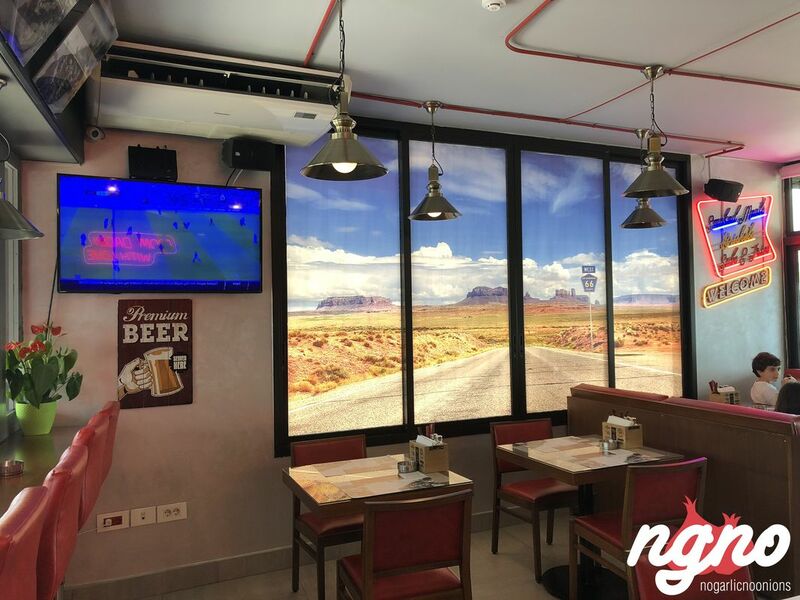 A photo of San Bernardino, Route 66 posters, red and yellow neon lights, personalized cutlery boxes, red leather sofas, a television broadcasting sports, and a terrace where smoking is allowed. 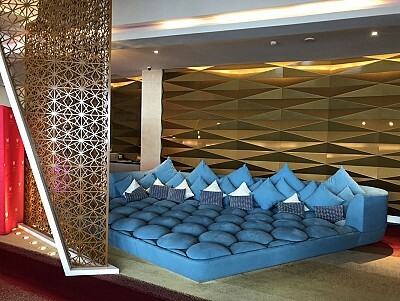 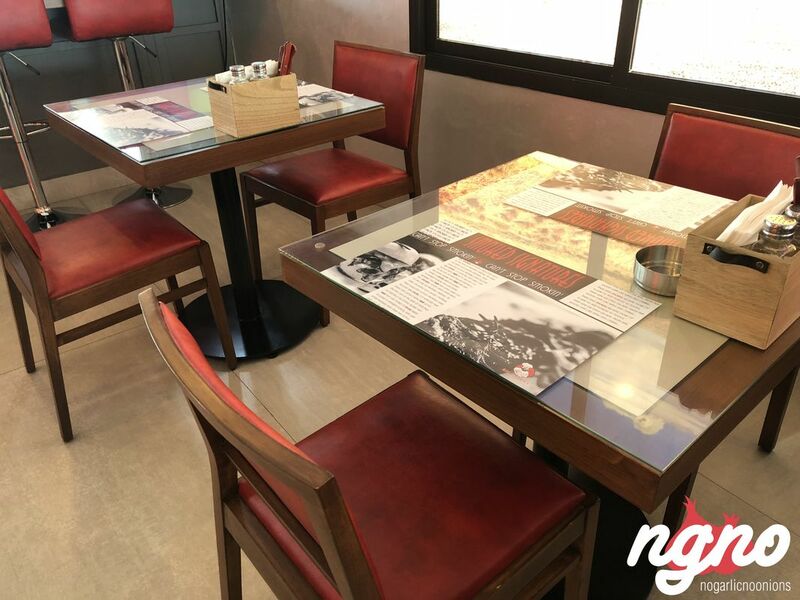 It feels good and fresh, a place for kids and their parents, a restaurant for adults and the young at heart. 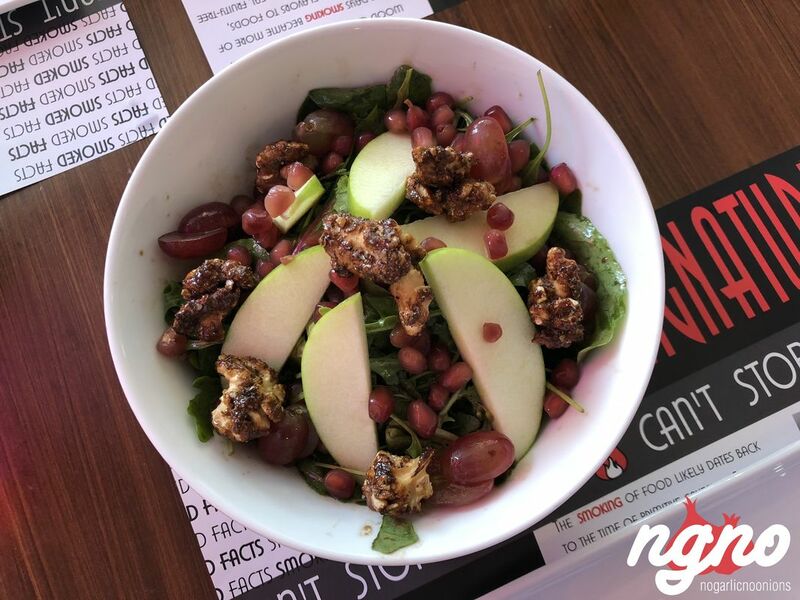 Waldorf salad: fresh Rocca, green leaves, sliced apples, caramelized walnuts, pomegranate and grapes, balsamic vinegar. 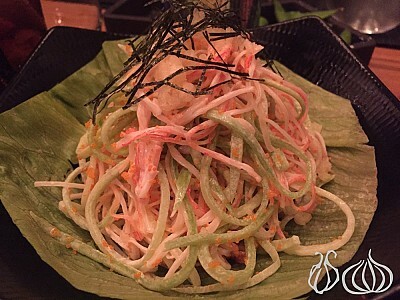 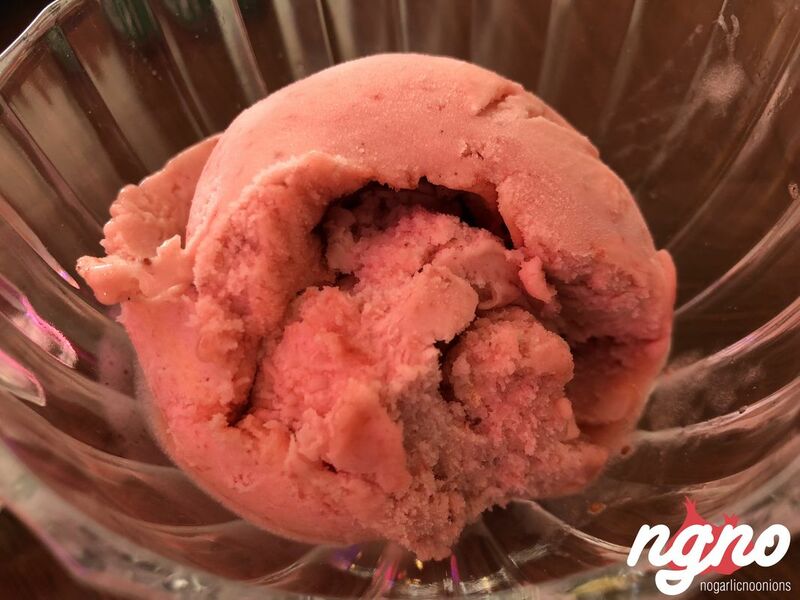 Served in a deep bowl, the mixture is a marriage of different textures, flavors, and colors. 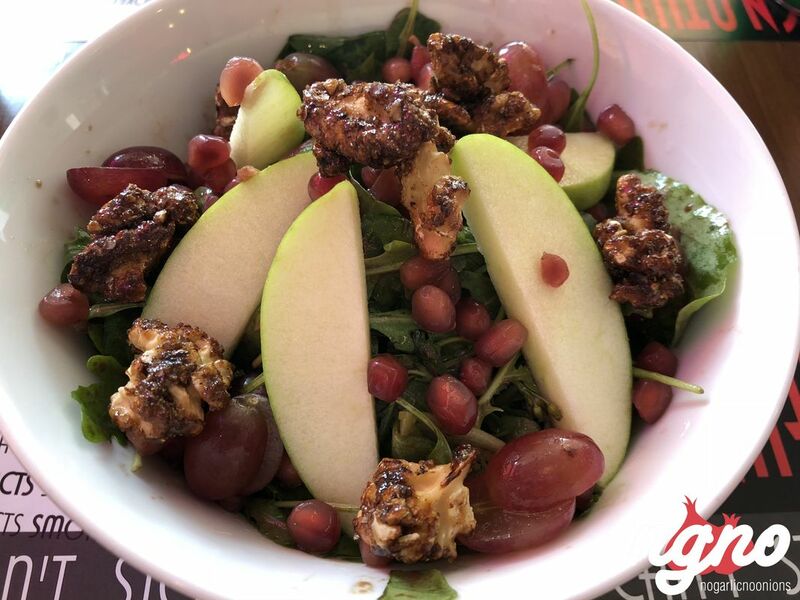 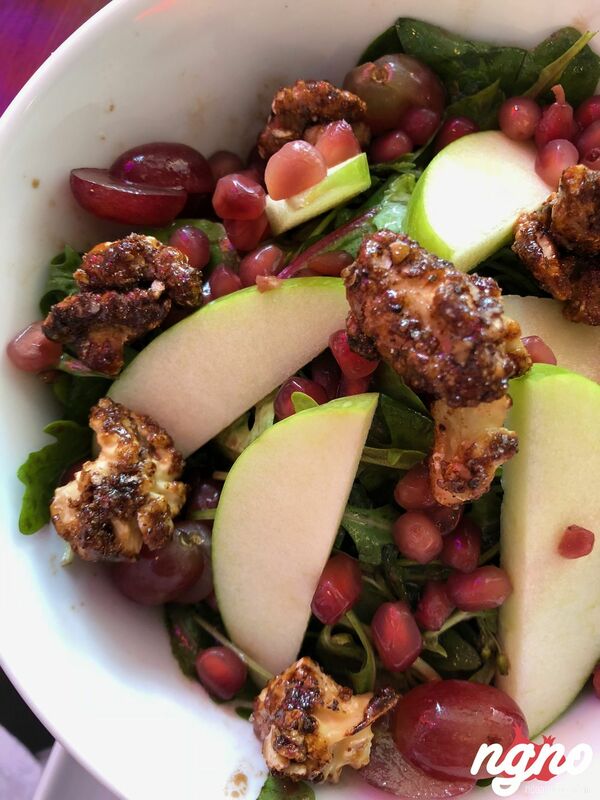 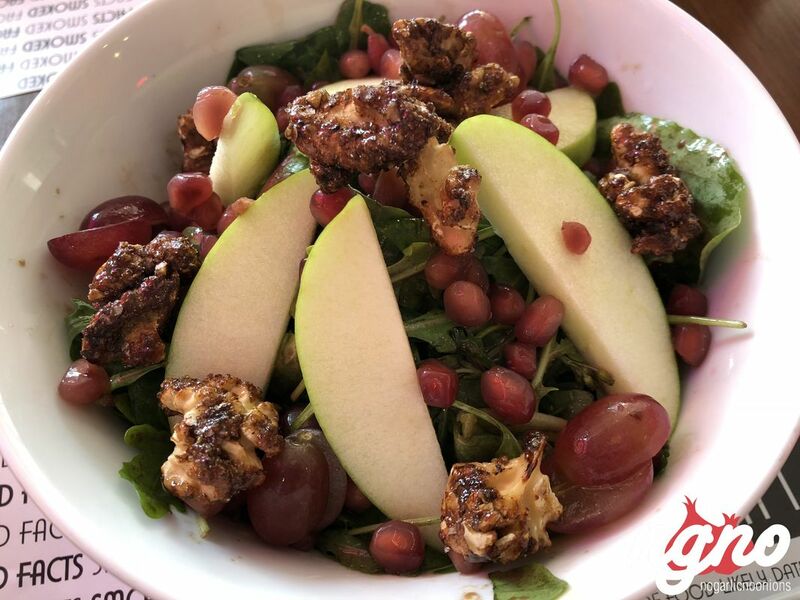 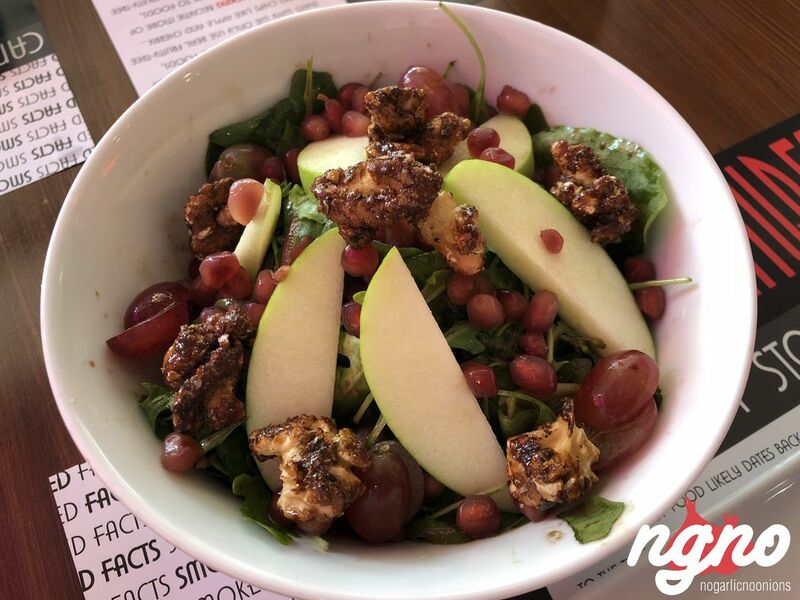 Crunchy caramelized walnuts, fresh greens, acidic pomegranates and refreshing grapes. 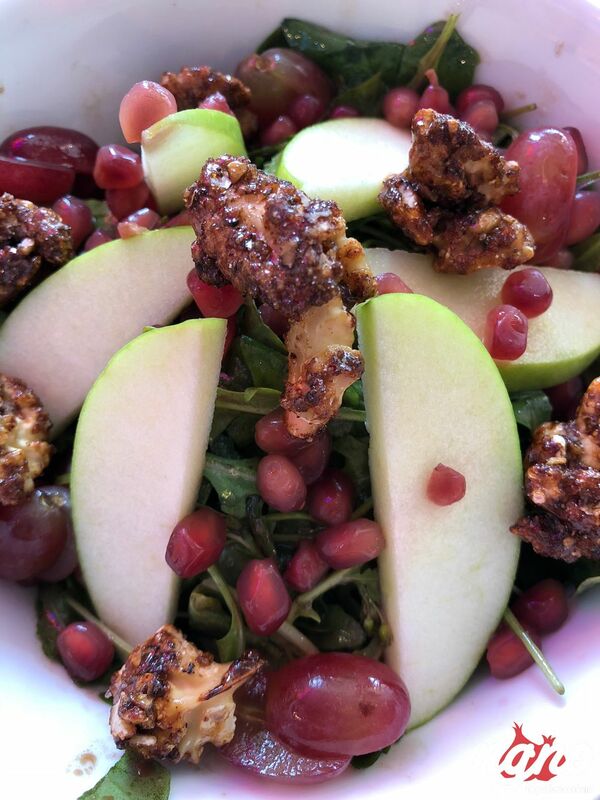 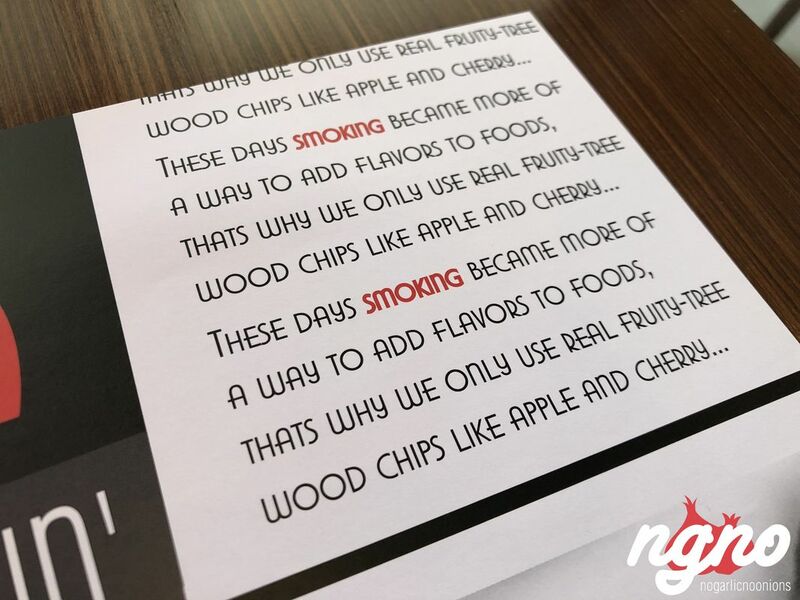 Zesty apples add life to the plate. 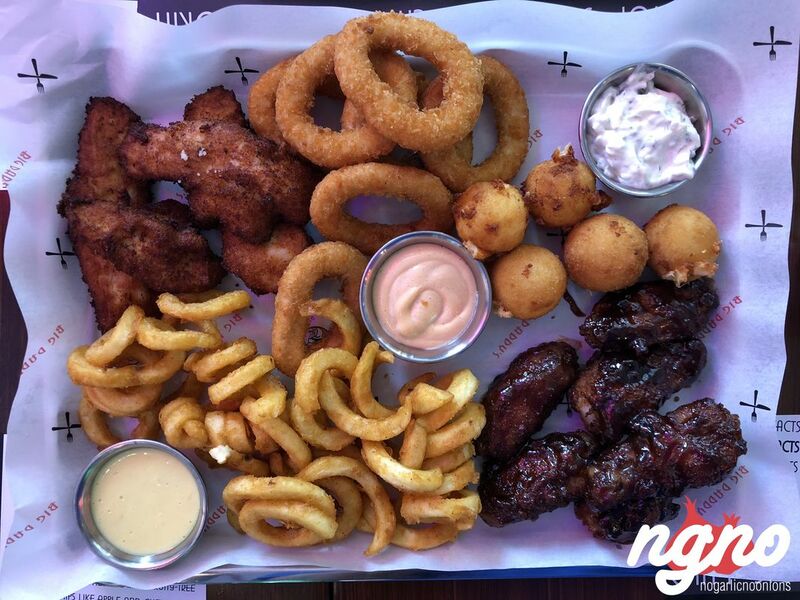 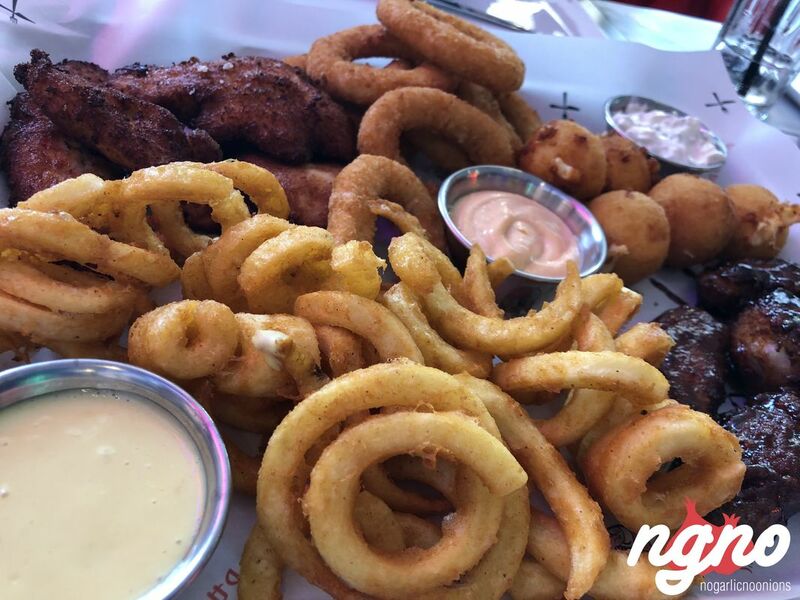 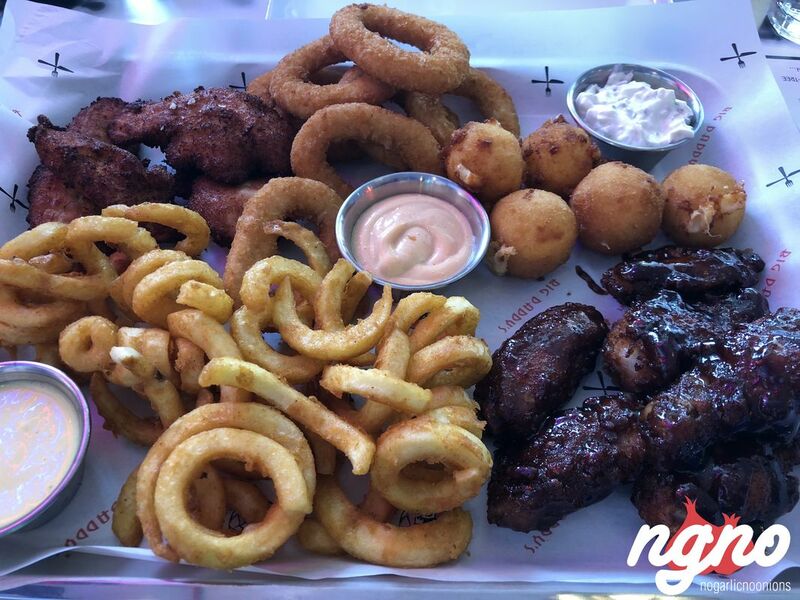 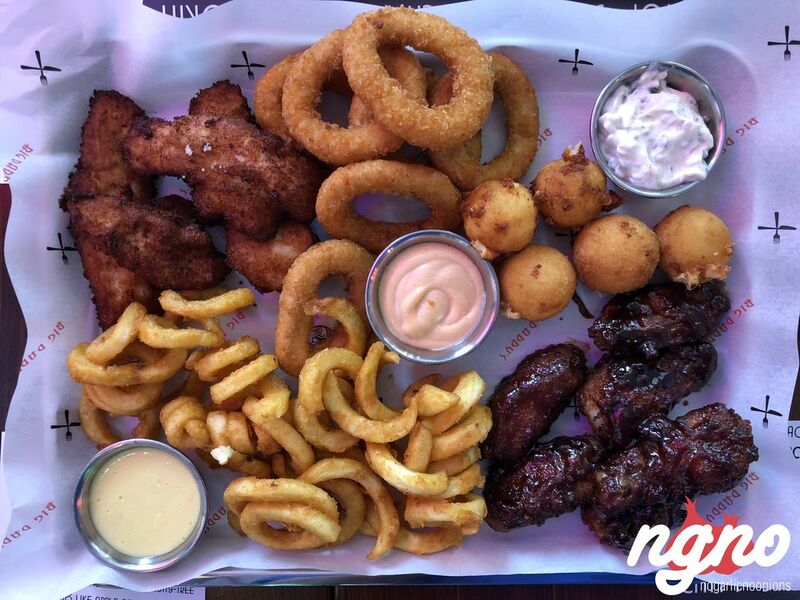 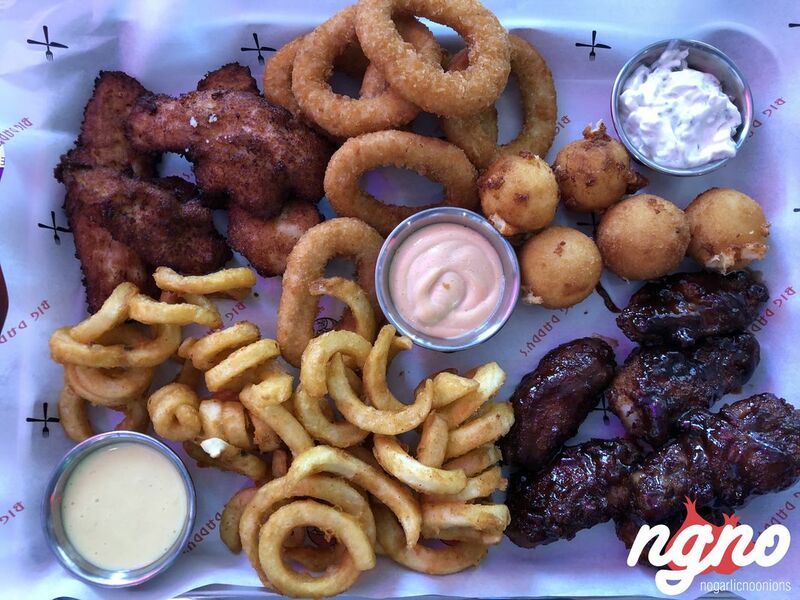 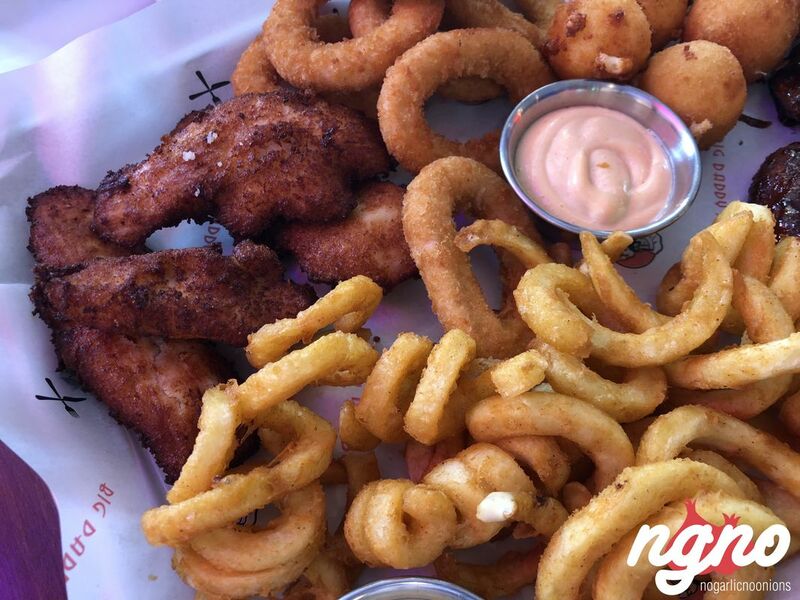 The combo: cheese balls, crispy strips, calamari rings, wings and curly fries, tartar sauce, honey mustard and thousand island dips. 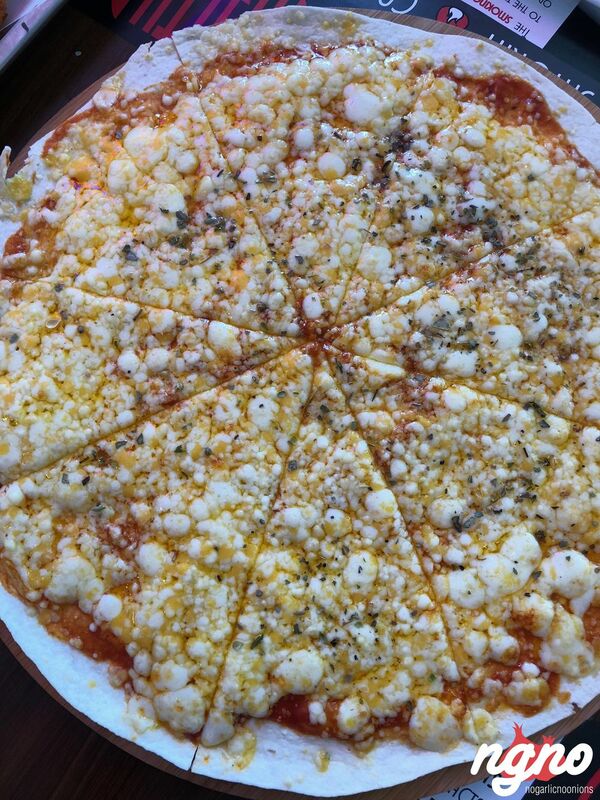 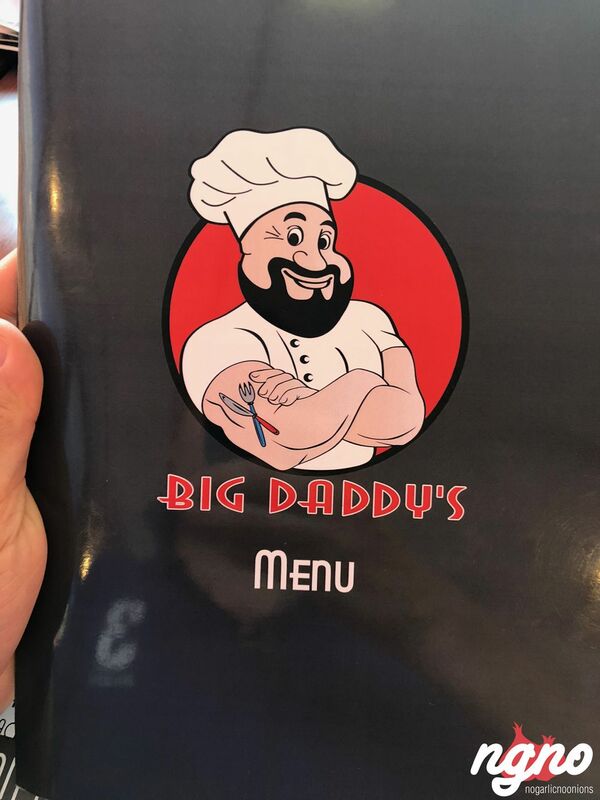 It’s a great way to start your meal. 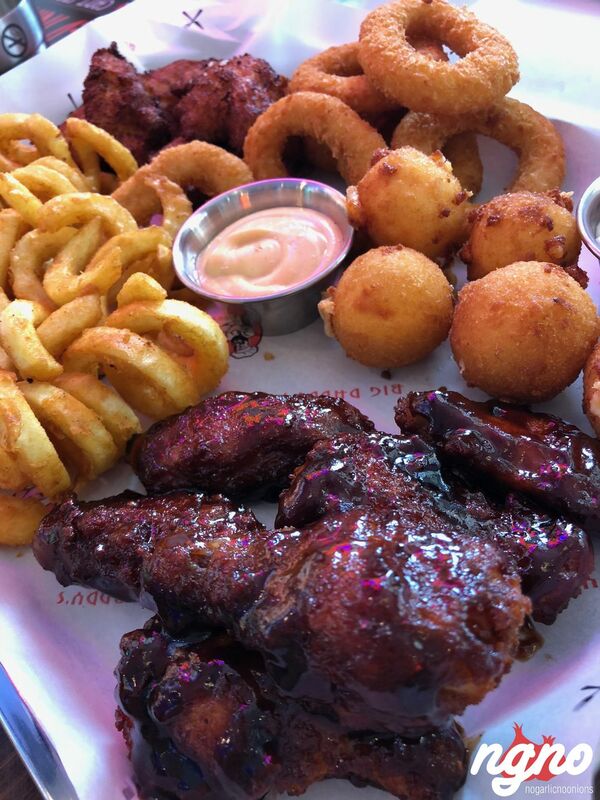 I’ll change; the wings’ taste is too strong, reduce or dilute the sauce. 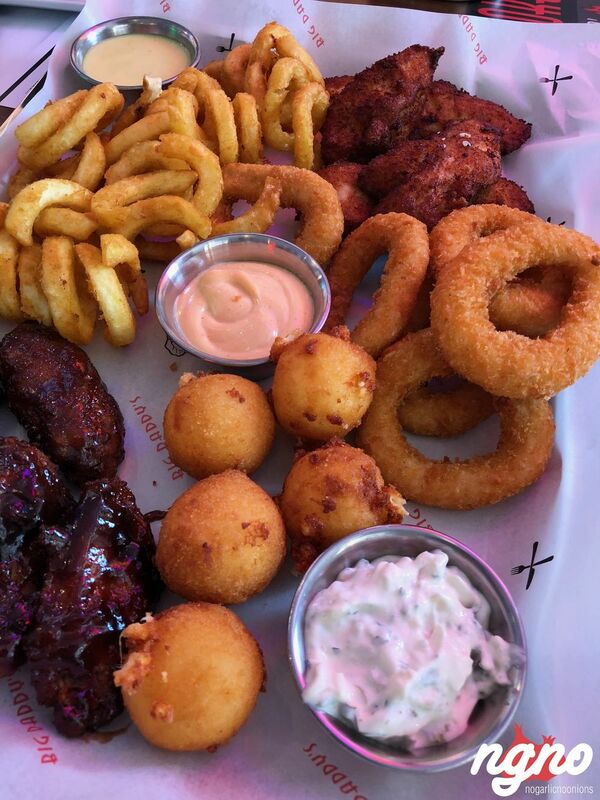 The chicken strips are dry. 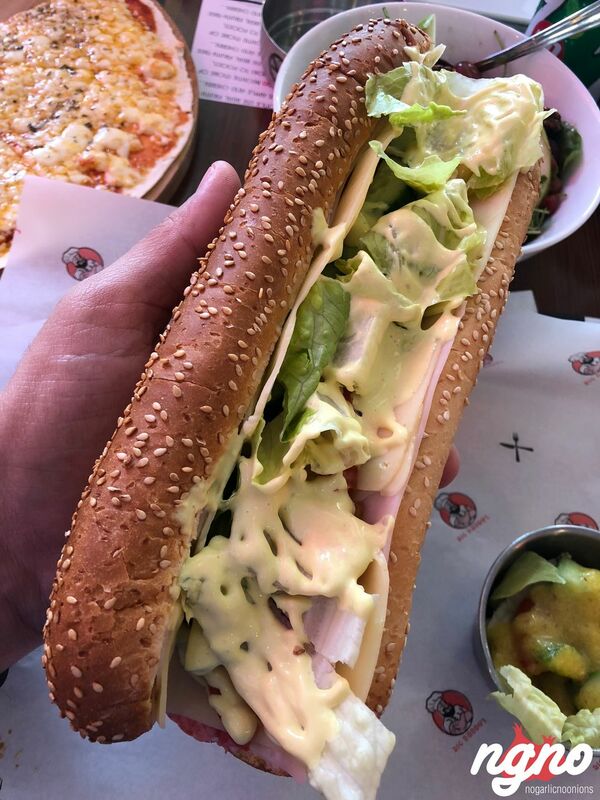 The honey mustard needs balance. 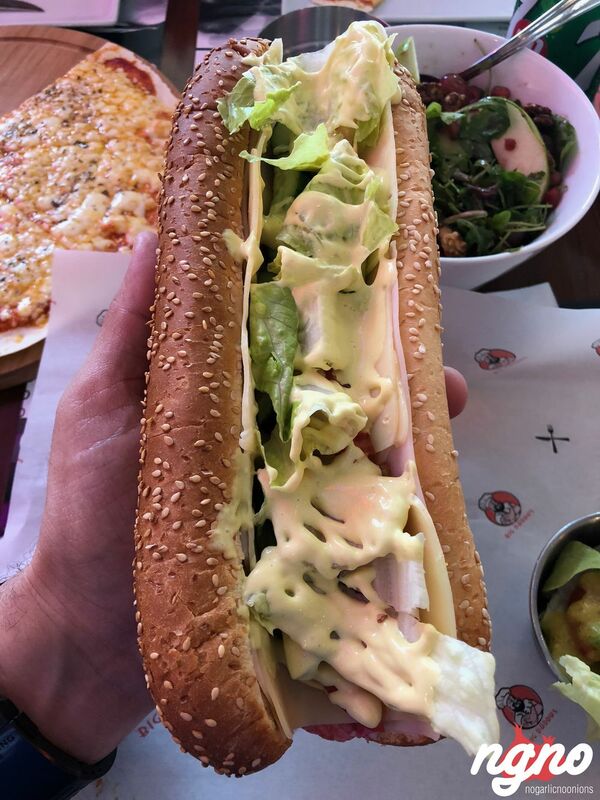 The submarine: smoked turkey breast, Swiss cheese, salami slices, lettuce, tomato and cucumber, mayo-mustard sauce. 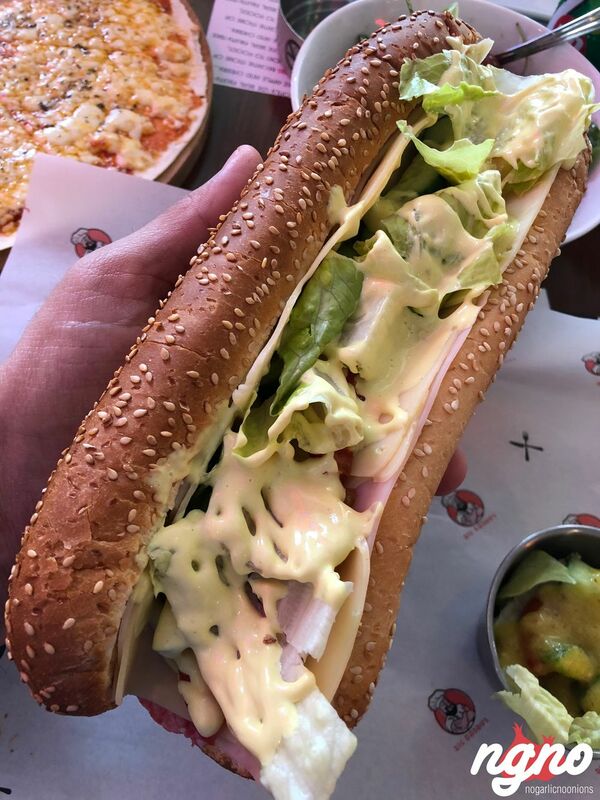 A fluffy bread covered with sesame and a load of ingredients. 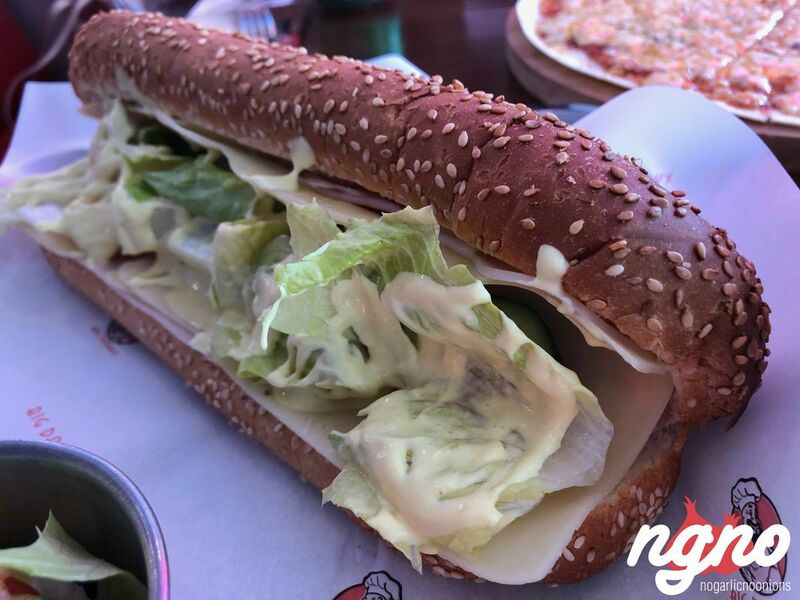 The sandwich is cold, cheese not melted and the bread is not emptied on the inside. 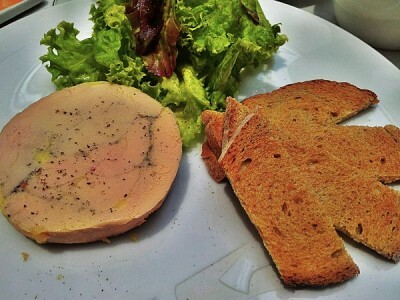 I would have grilled it open-faced on the salamander, and buttered it a bit to give it some love and flavors. 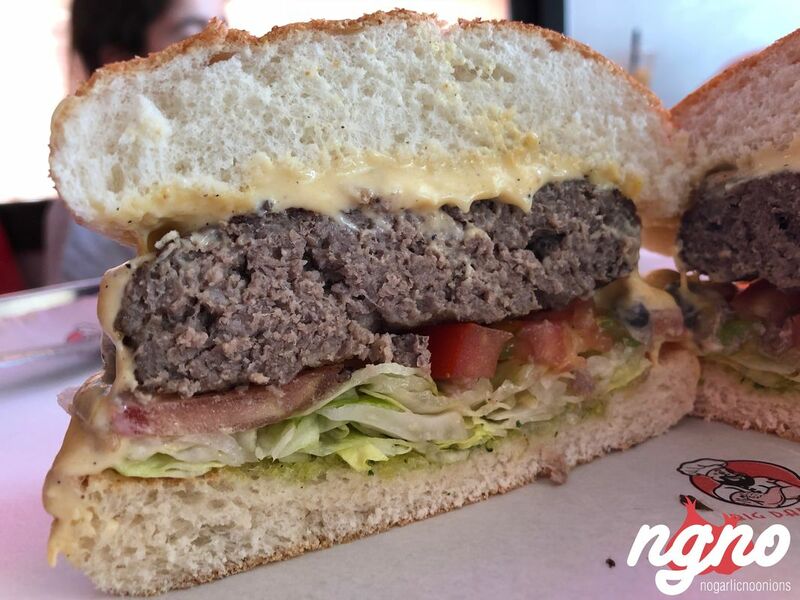 The cheeseburger comes with a very thick juicy patty. 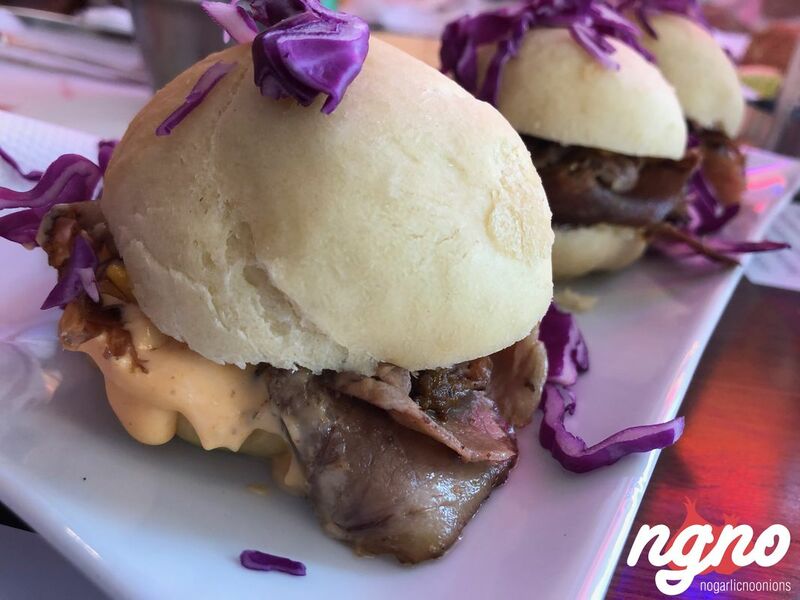 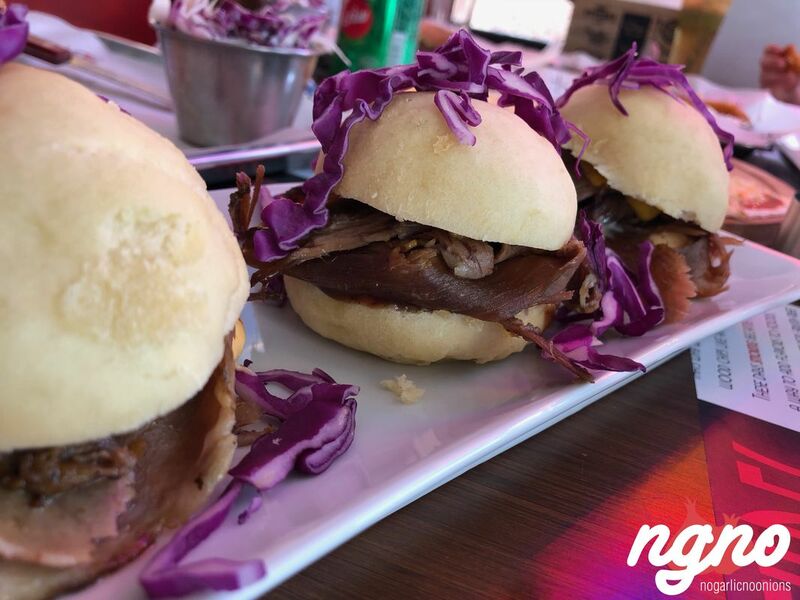 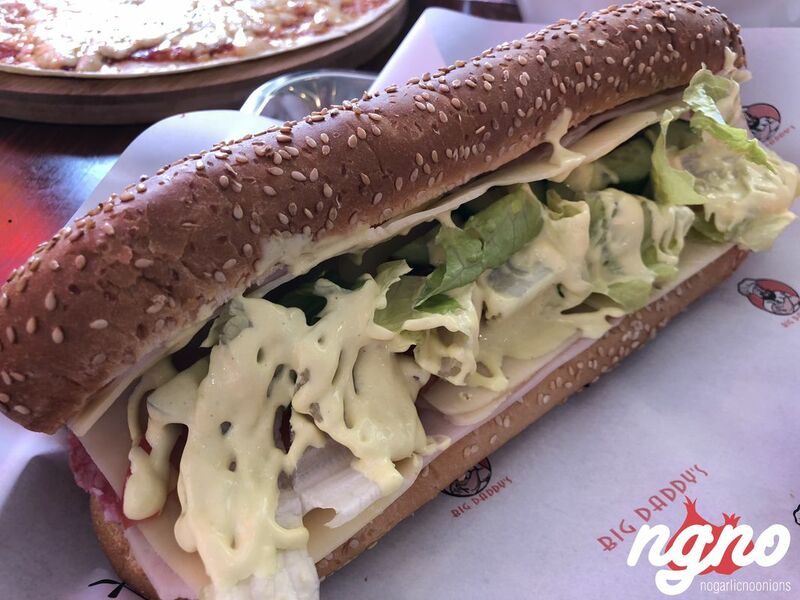 I like the bread decorated with herbs and the meat that tastes like meat without the unneeded additives cheap diners add. 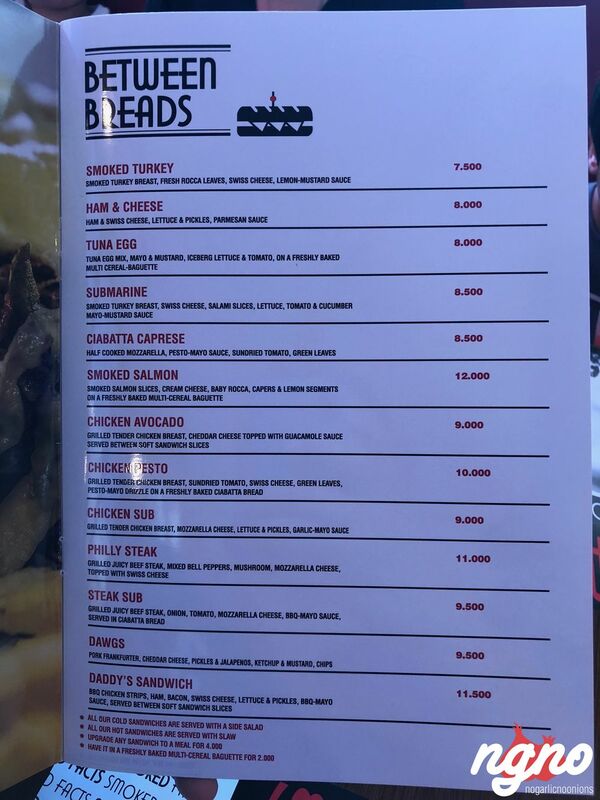 I would have cooked it less and buttered the bread. 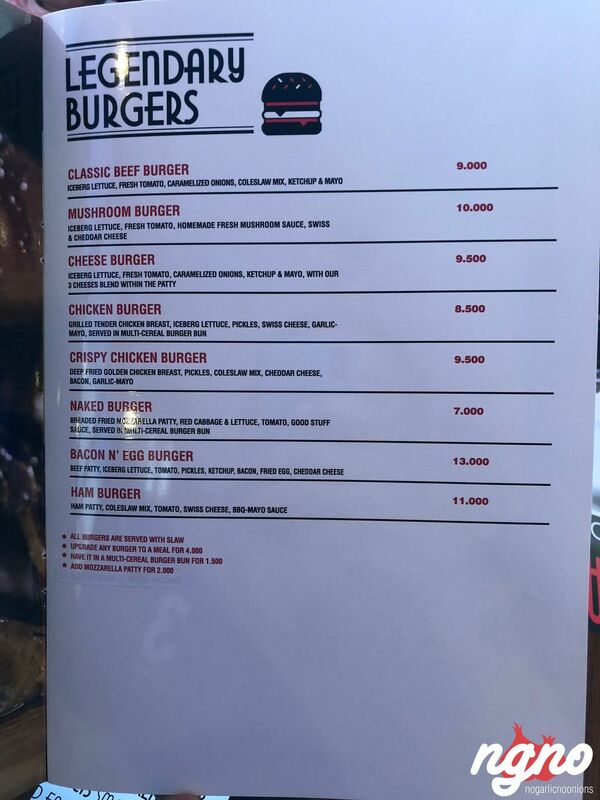 The mushroom burger looks nice... it only needs a balance so that the different parts blend. 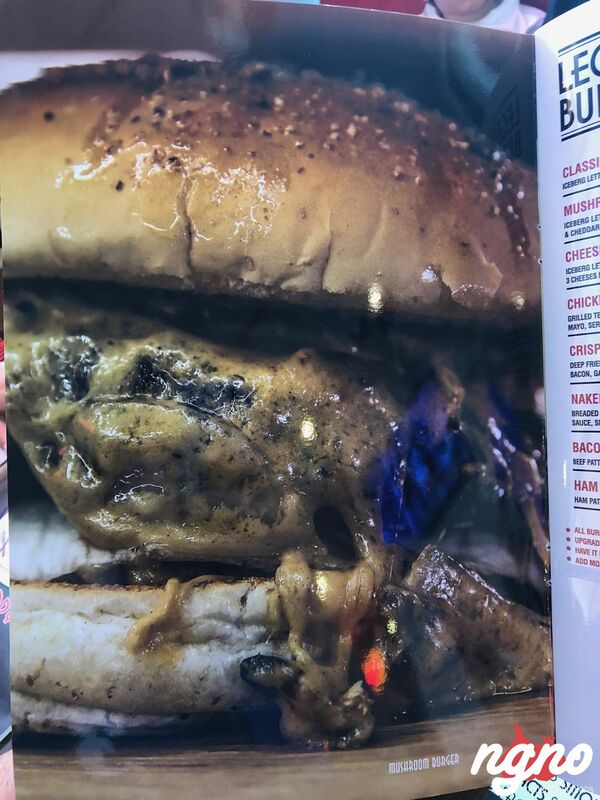 Lightly heating the bread, under-cooking the meat, cutting the tomato thinner and using more mushrooms -isn’t it a mushroom burger? 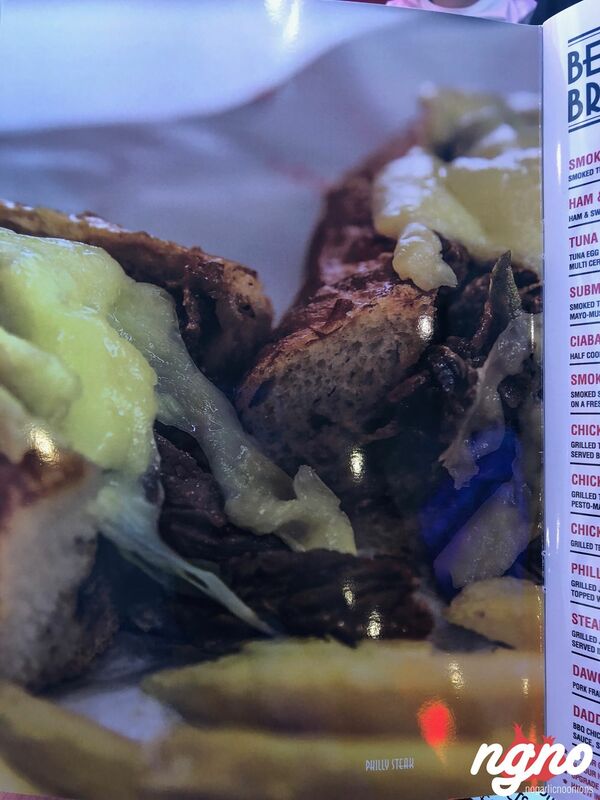 Using purple cabbage for a coleslaw is a mistake. 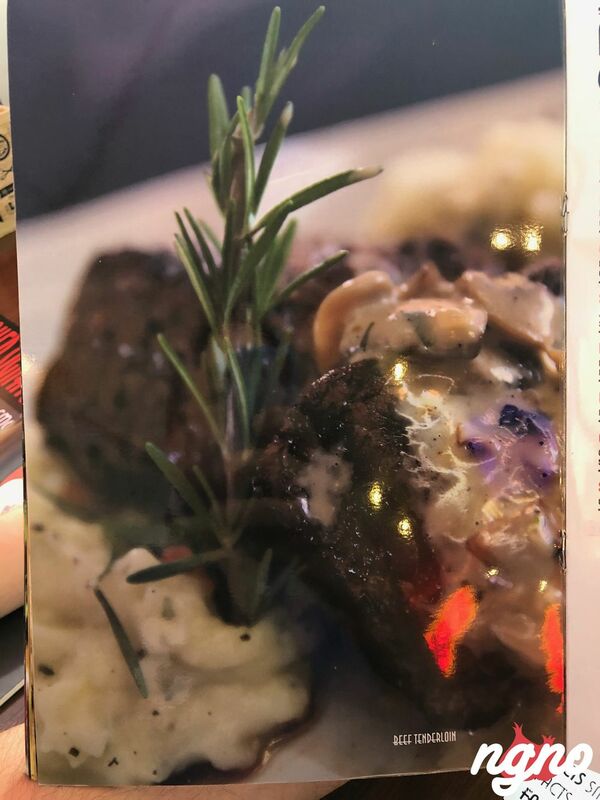 The purple cabbage is hard textured and sometimes bitter. 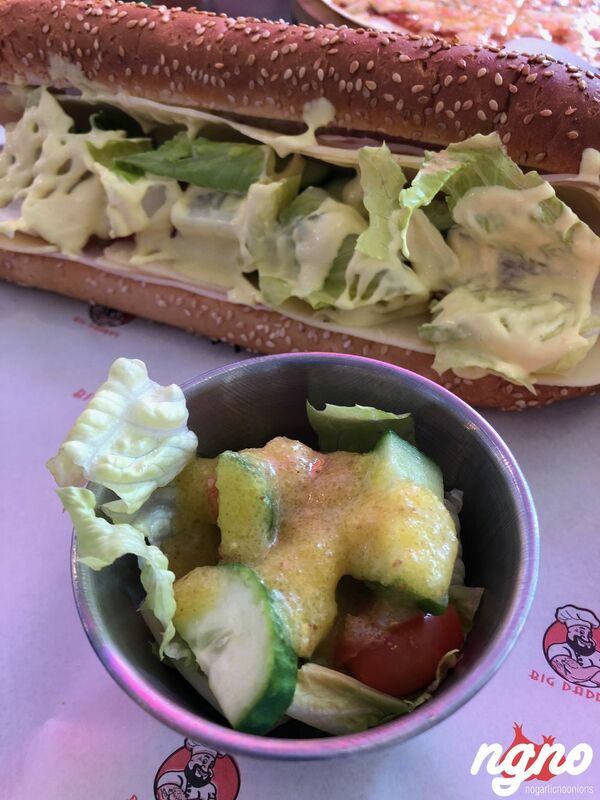 I’ll use normal cabbage, add more mayo, flavor it with a hint of sugar, drizzle it with lemon and decorate it with purple cabbage. 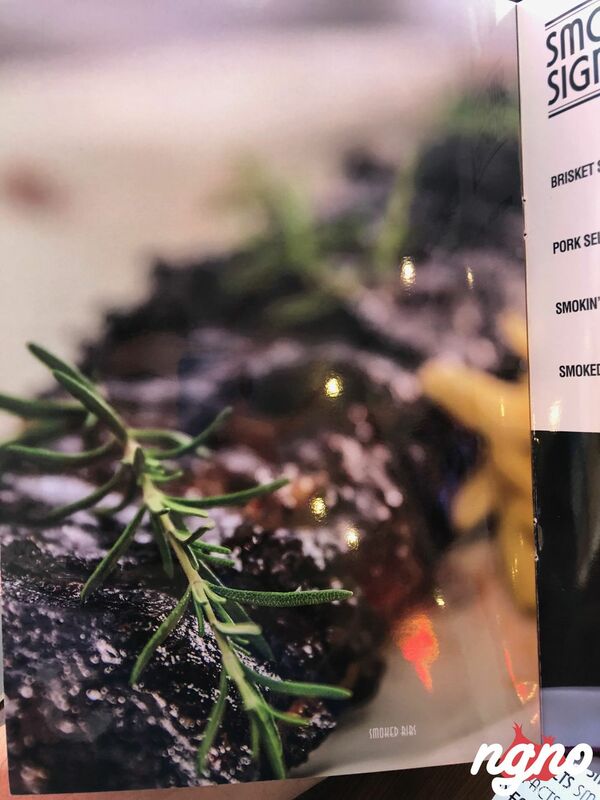 Homemade brisket needs to be way juicier! 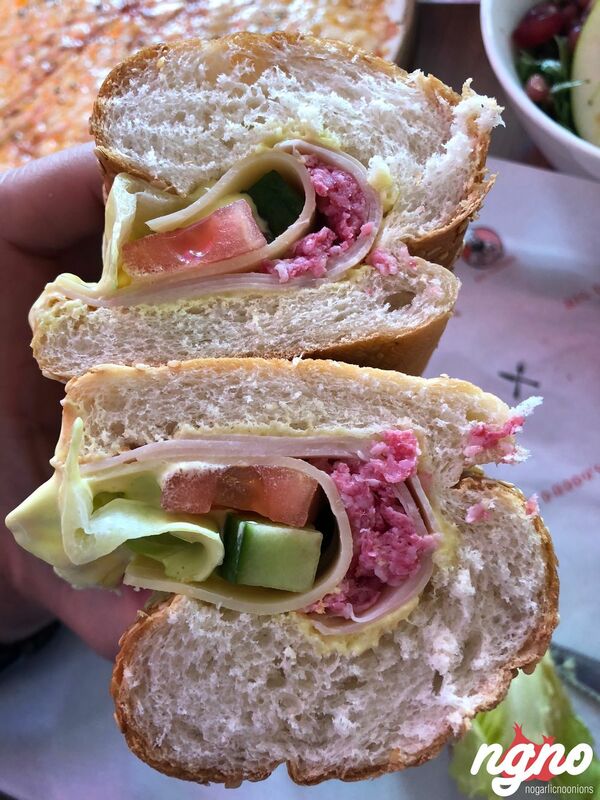 Too hard and cut too thin, it feels like supermarket ham. 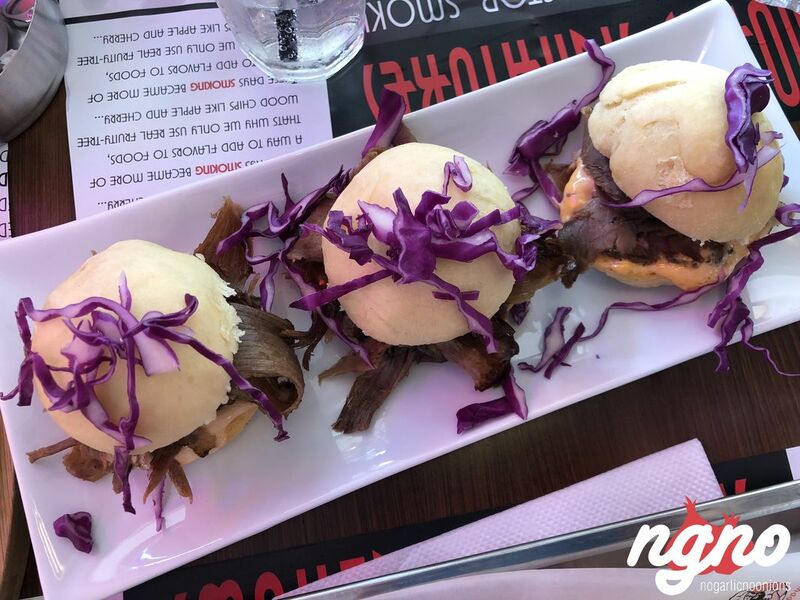 The homemade bao buns are not “bao buns to start.” More of hard textured, old bread, lacking stickiness and airiness. 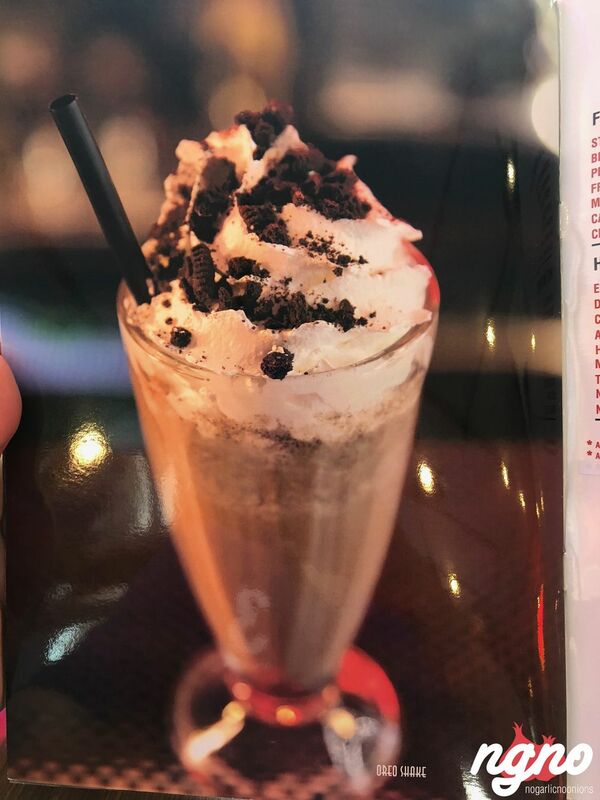 Not what I expected and not something I’ll order again. 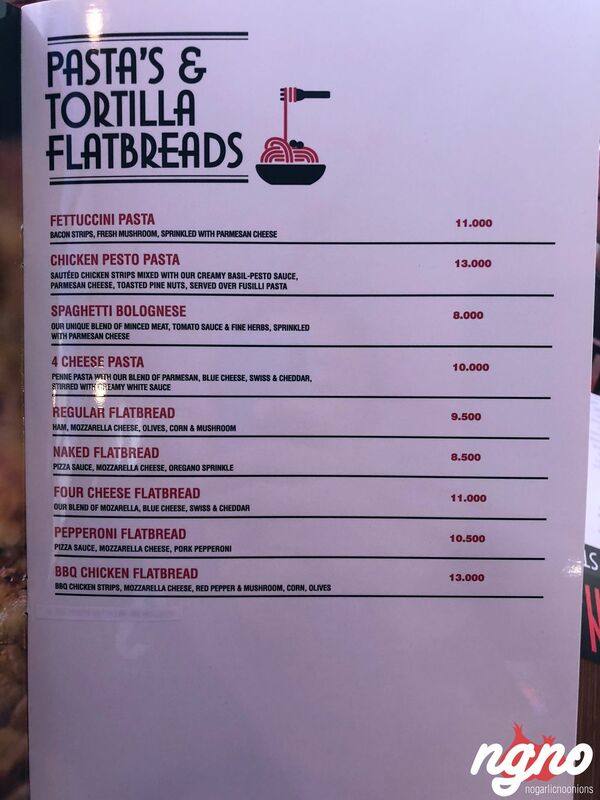 Naked flatbread feels like a dessert wrap. 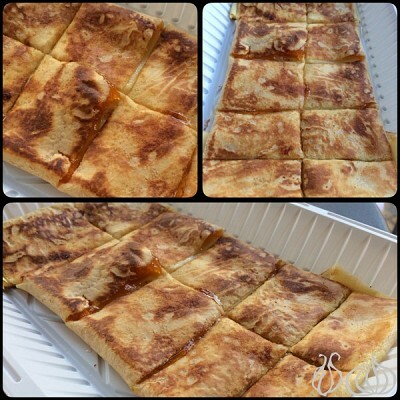 A thin and chewy precooked bread topped with a sweet tomato sauce; this thing is unpleasant to eat. 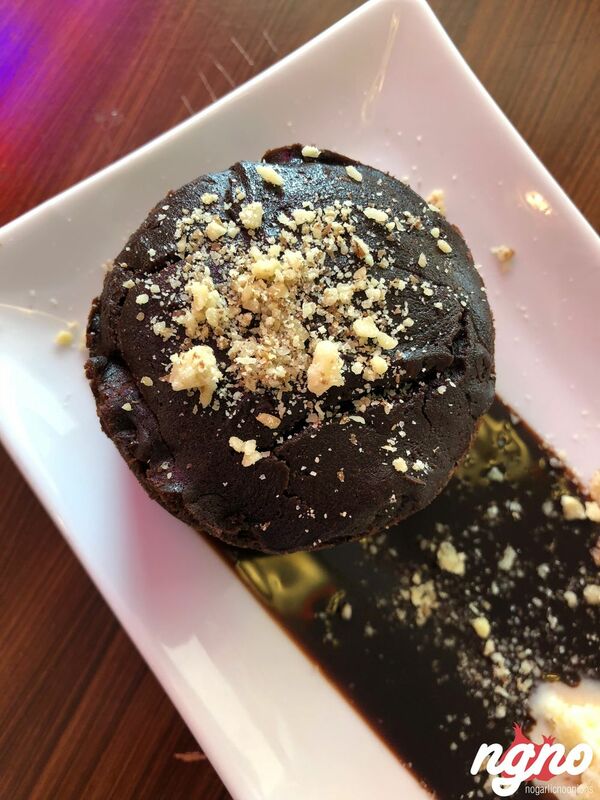 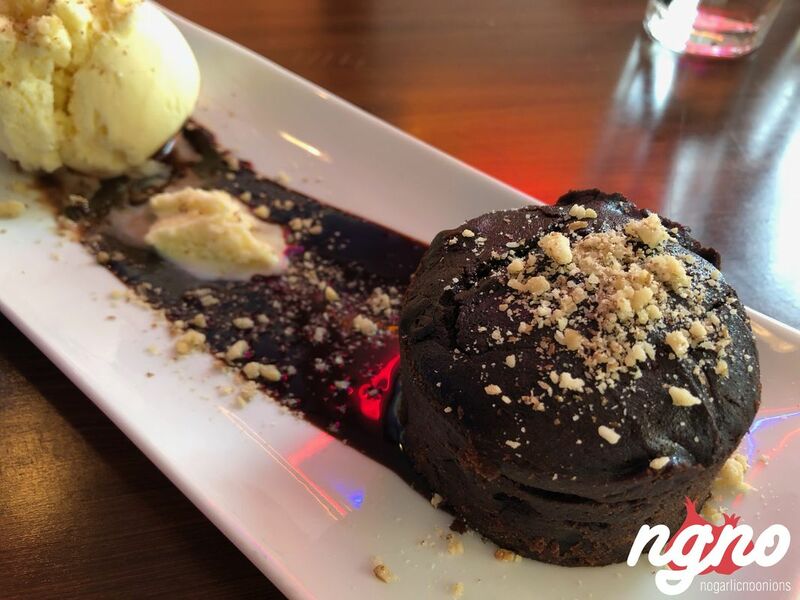 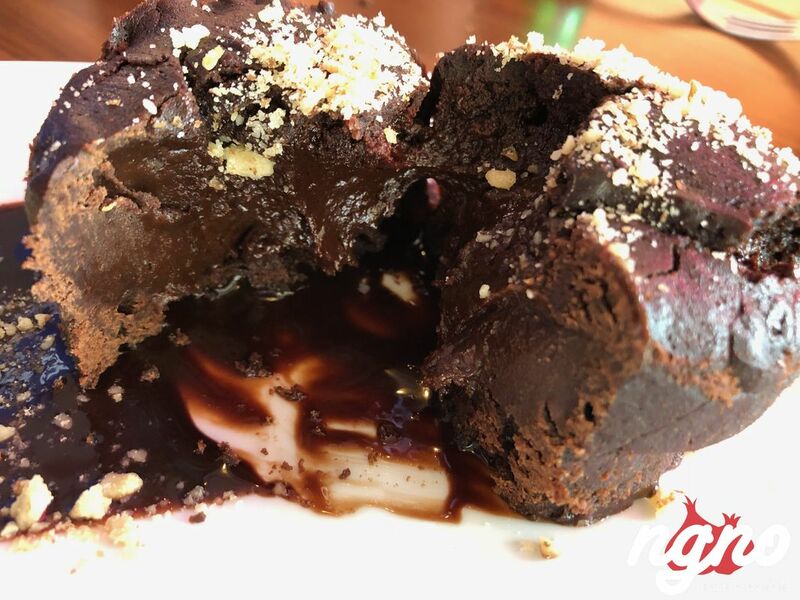 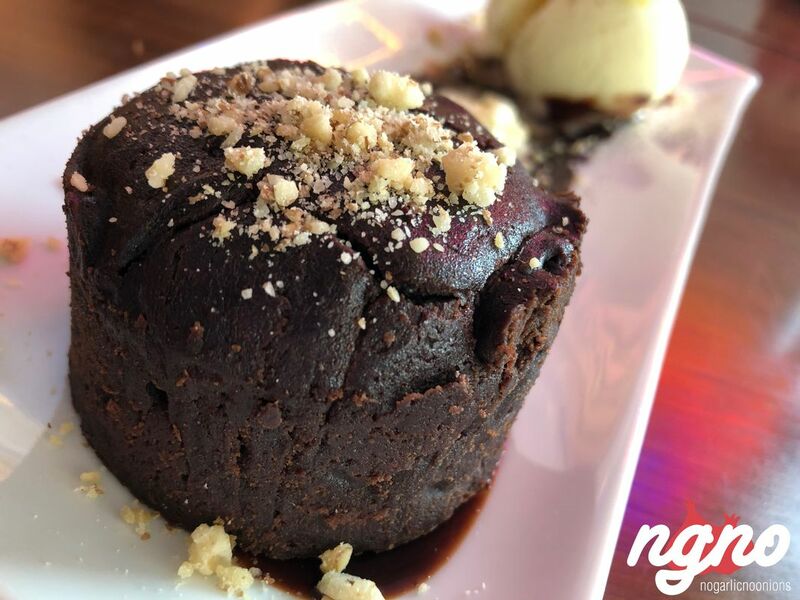 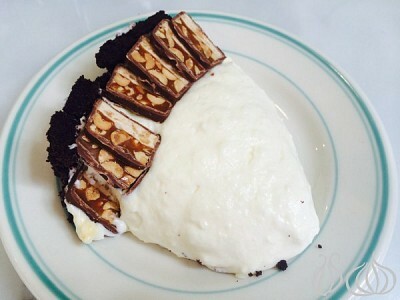 Dark chocolate cake: a good quality dark chocolate cake that is unfortunately served cold and not melting on the inside but hard textured and overcooked. 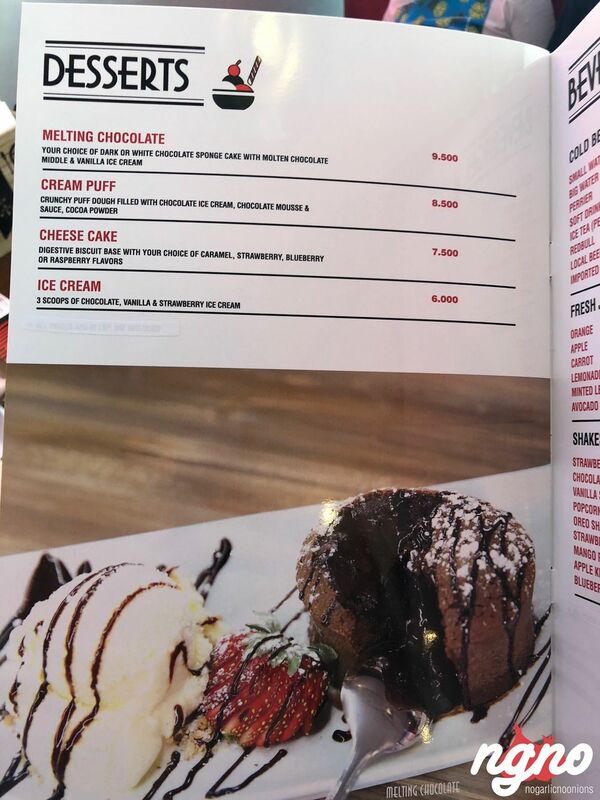 The vanilla ice cream is too sweet and commercial. 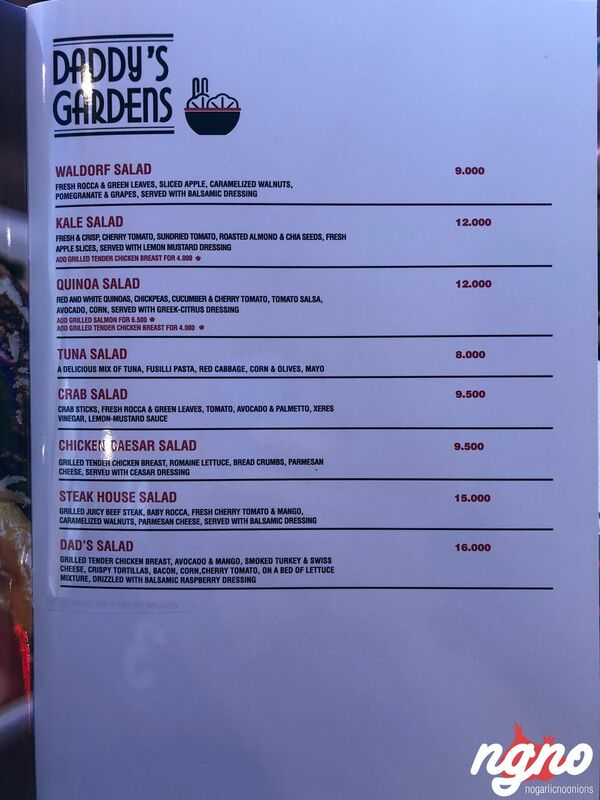 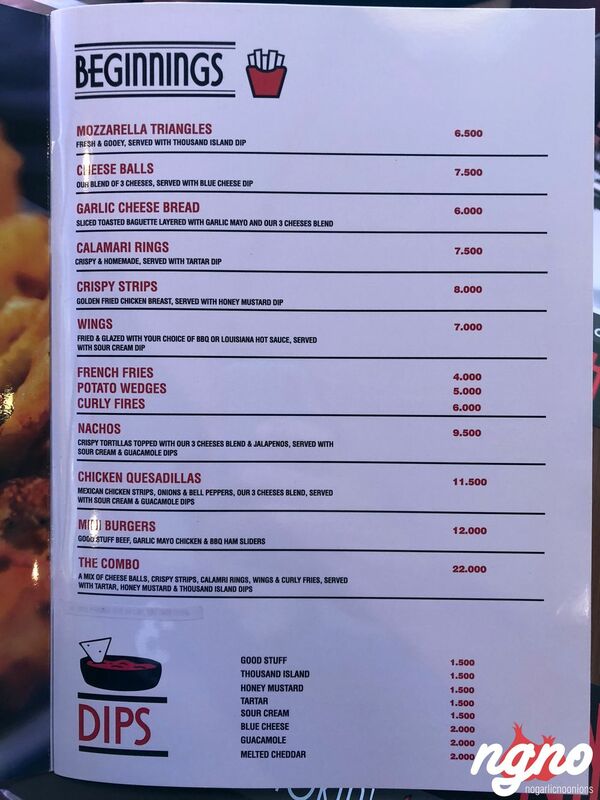 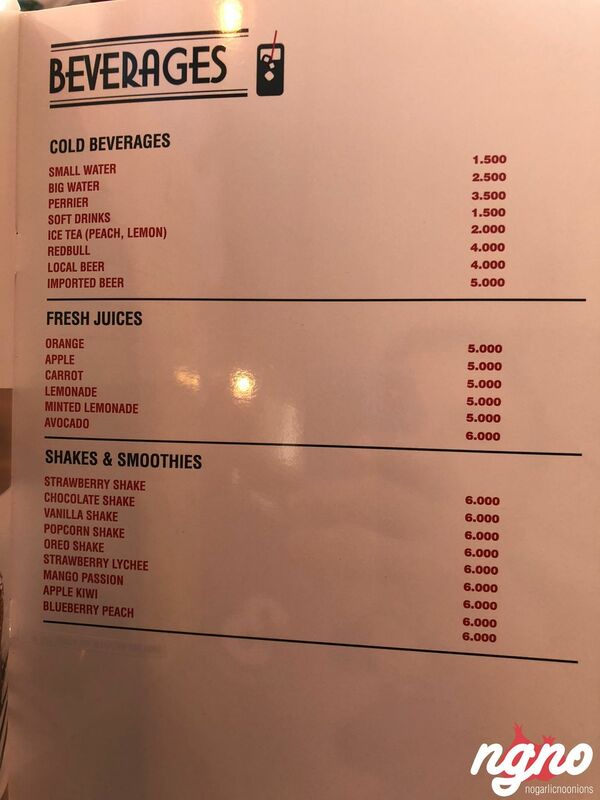 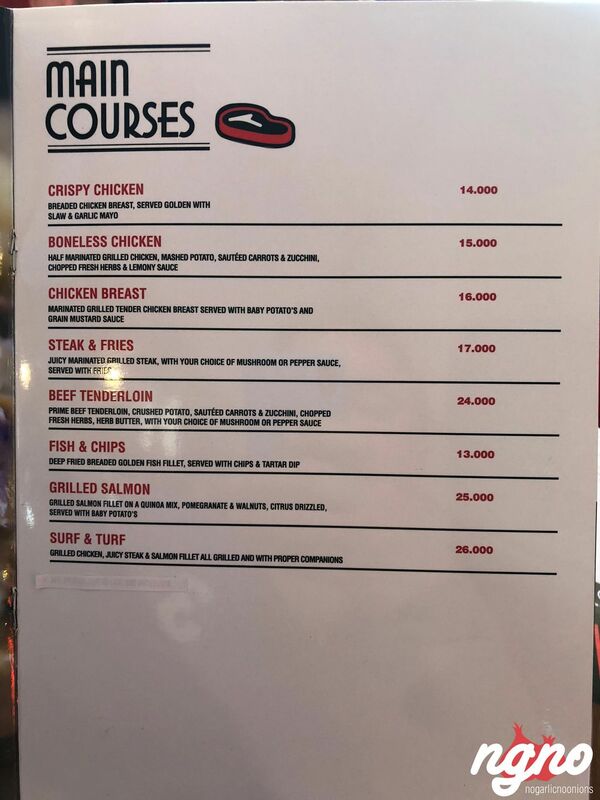 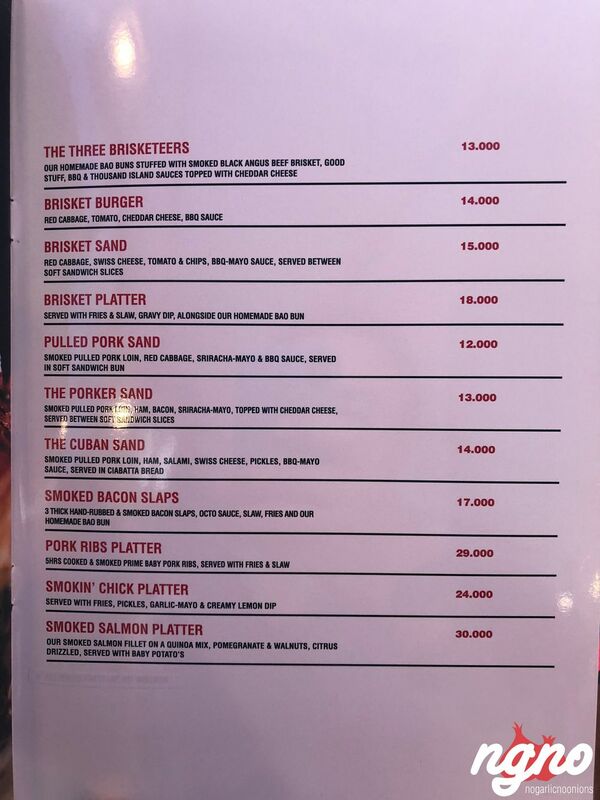 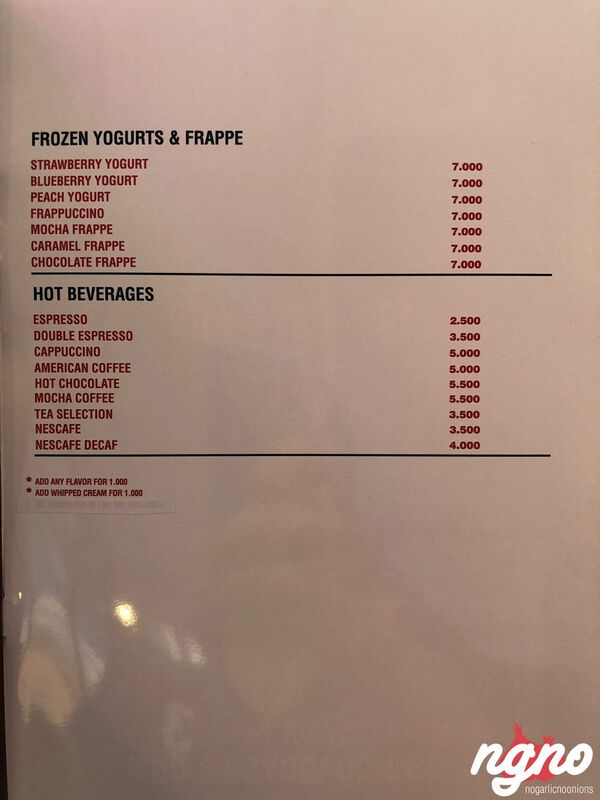 The wide choice of items proposed on the menu. 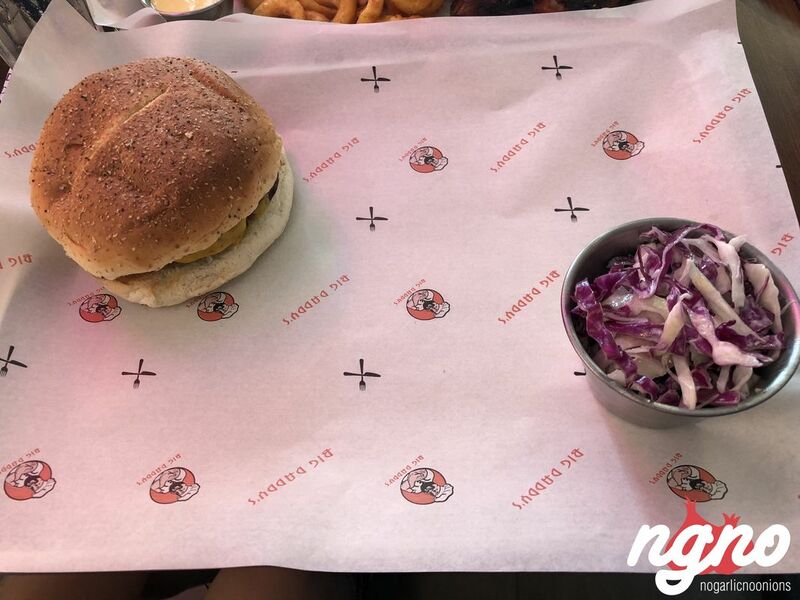 The placemats are too thin; the paper should be thicker. 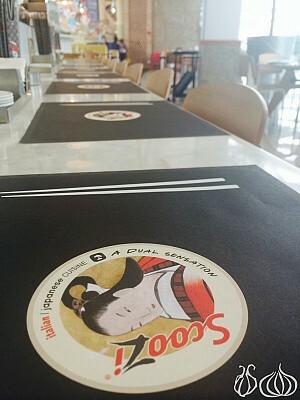 The placemat design and menu feel don’t reflect the American diner freshness and positivity of the place. 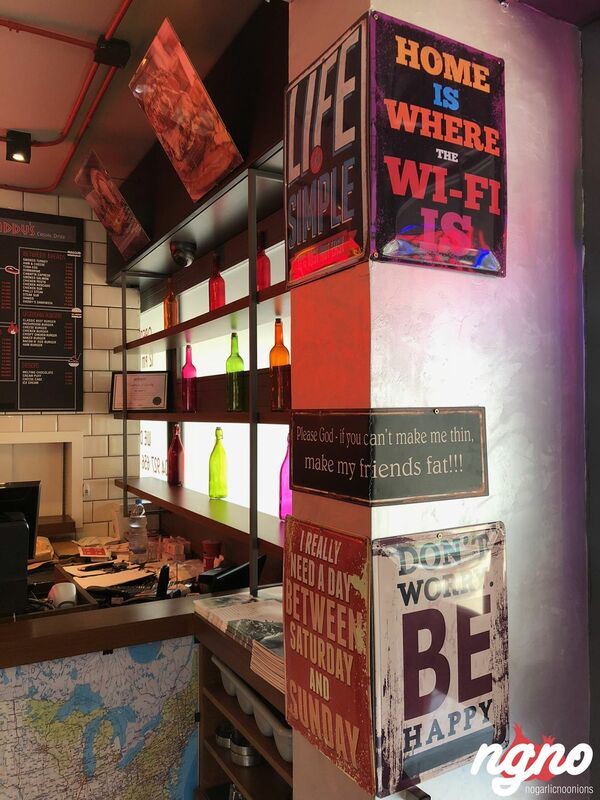 Lights are too yellow, dark and dimmed. 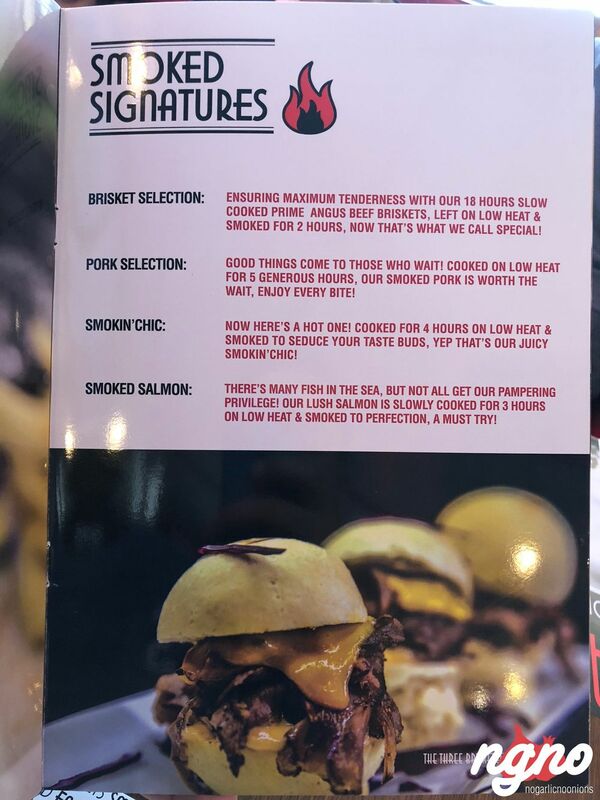 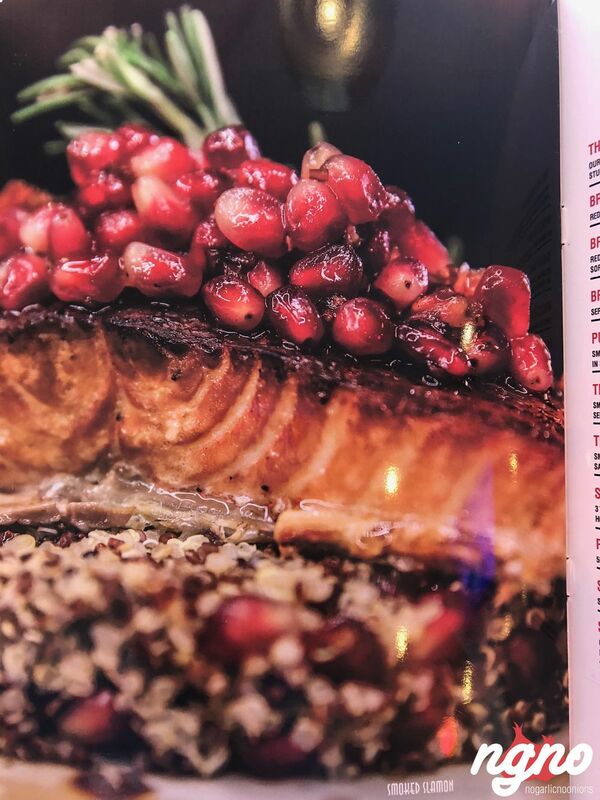 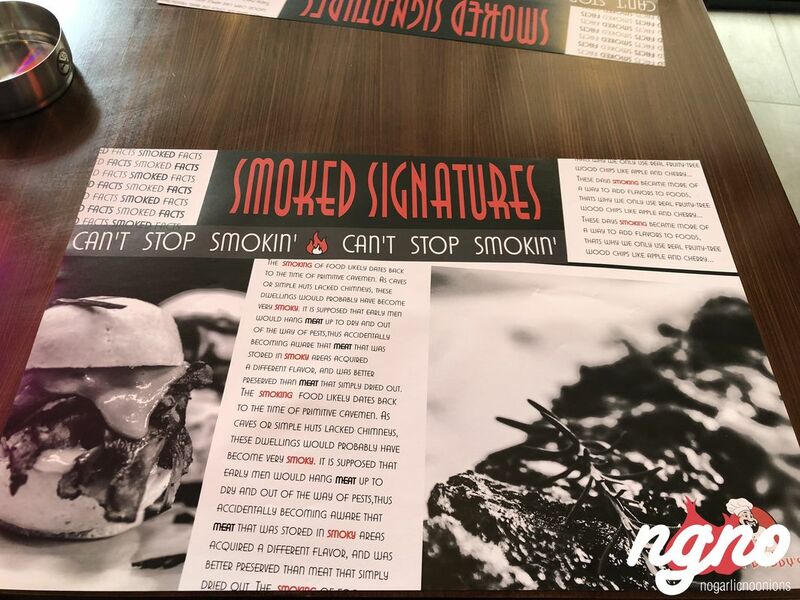 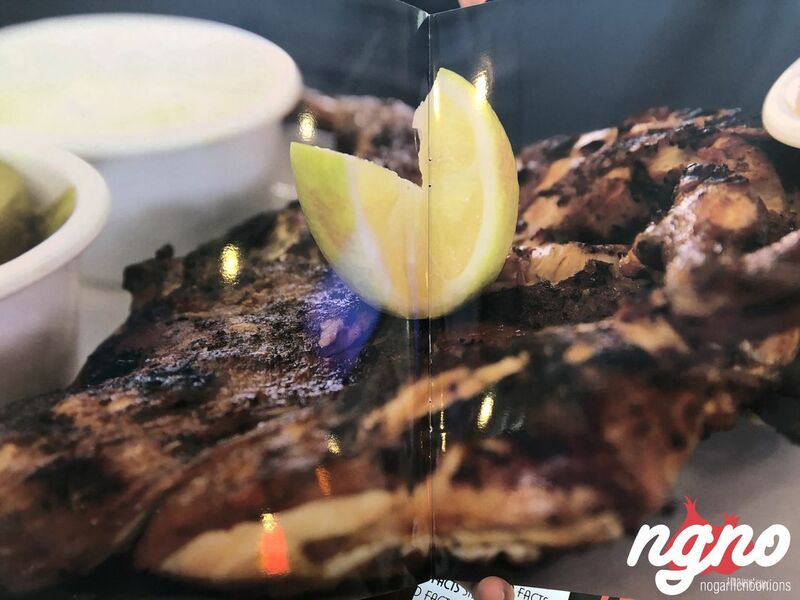 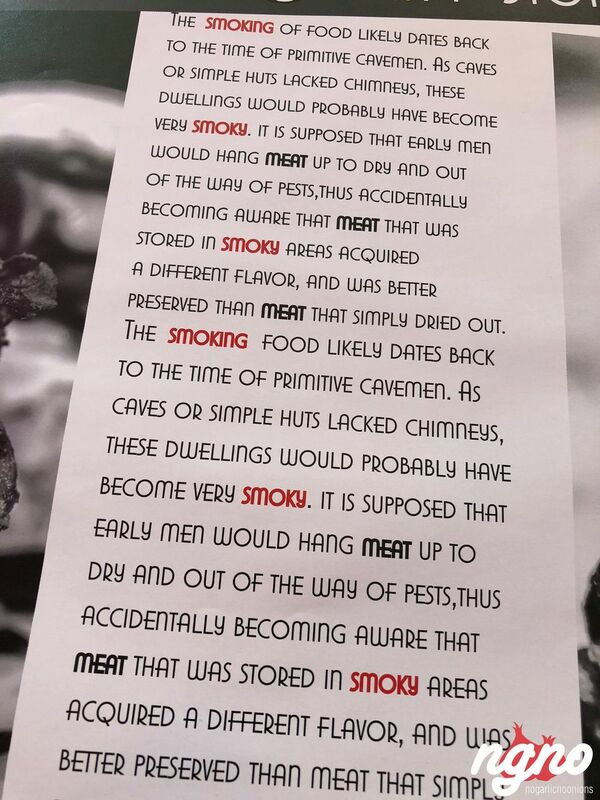 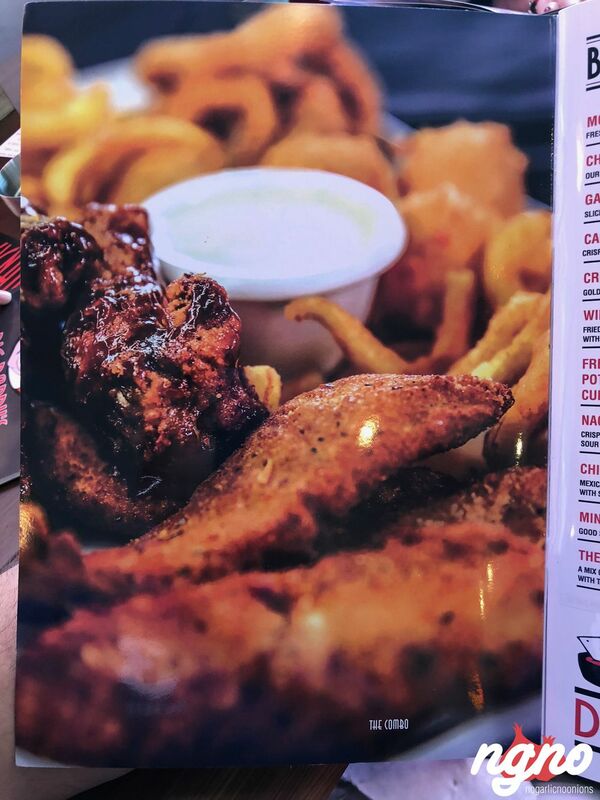 Menu photos need to be changed; they are unclear and dark. 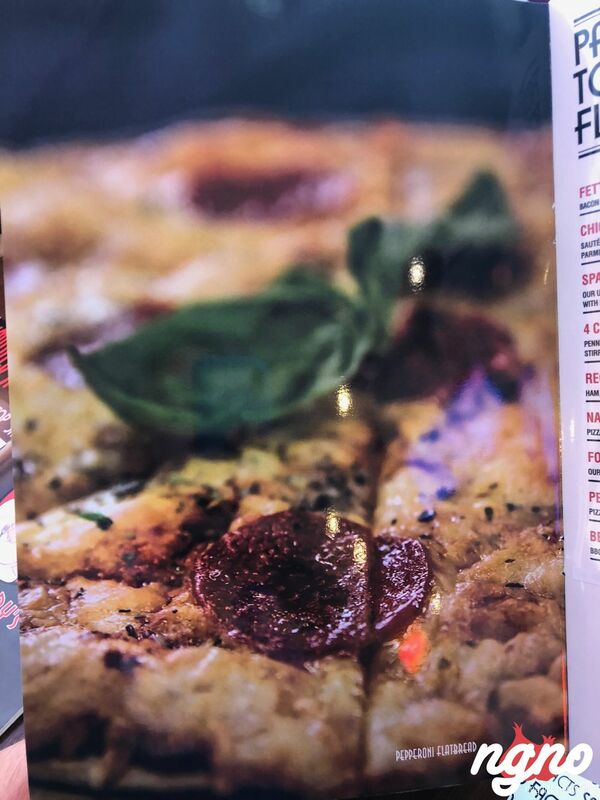 This doesn’t help to sell more food. 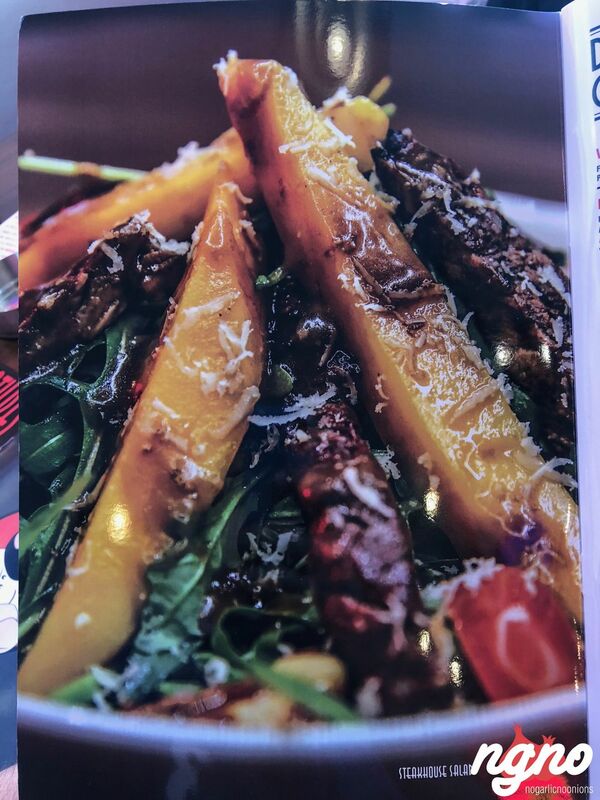 Change the photographer; A menu needs to have clear photos, not artistic ones. 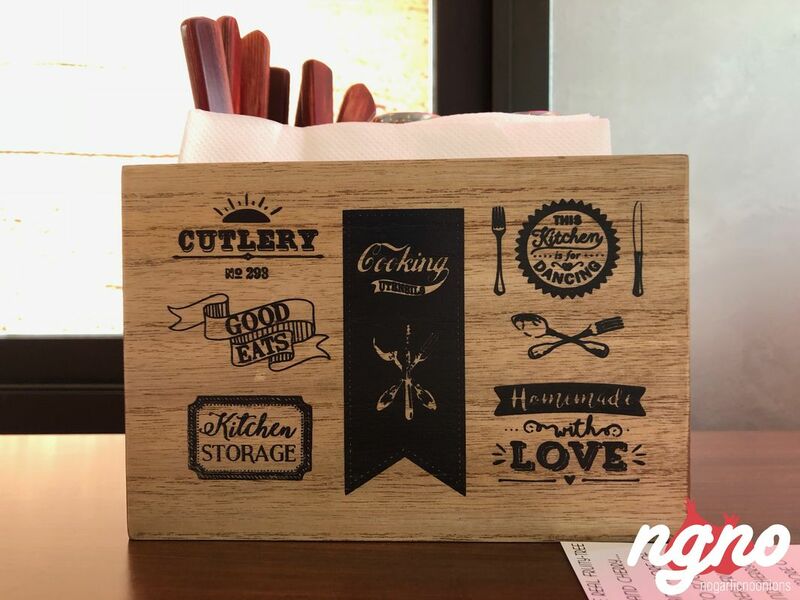 Find a better way to heat the food. 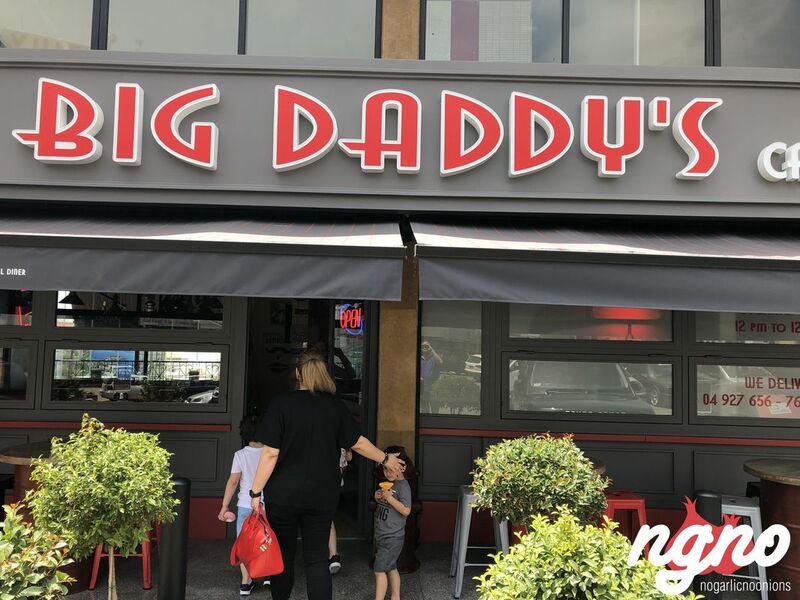 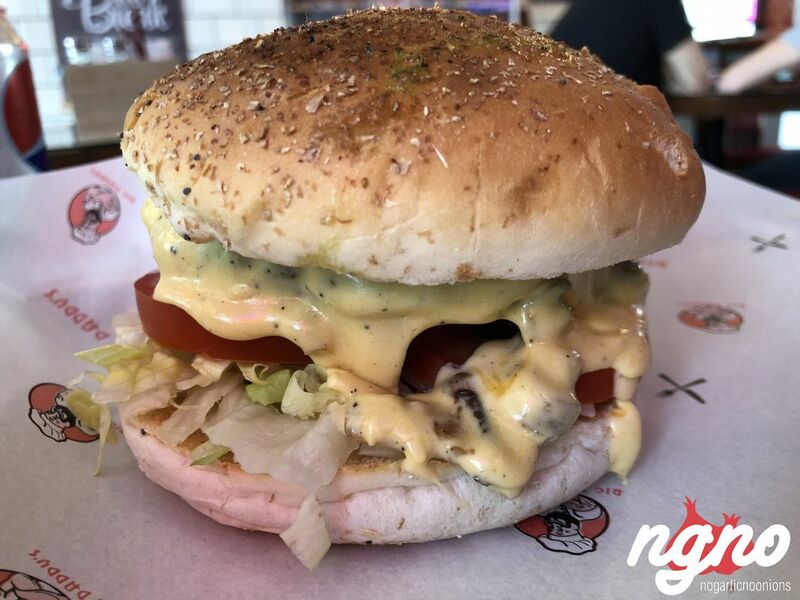 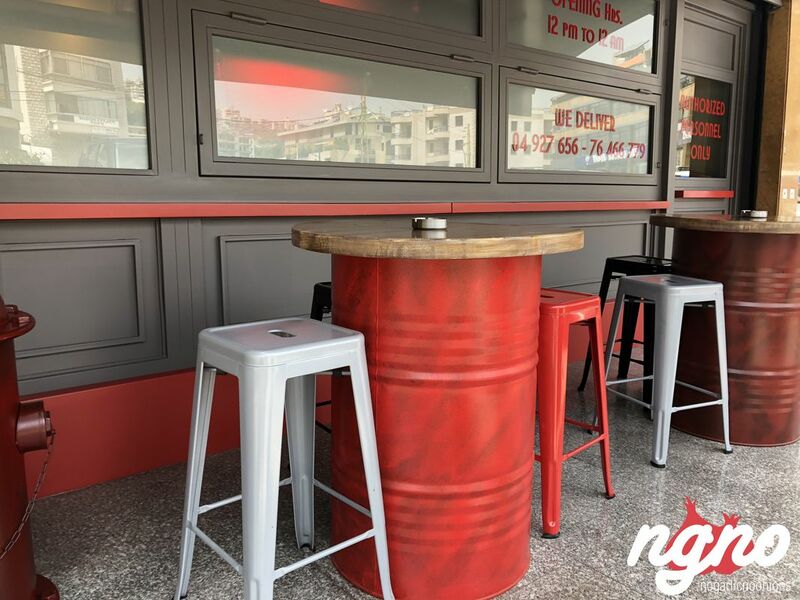 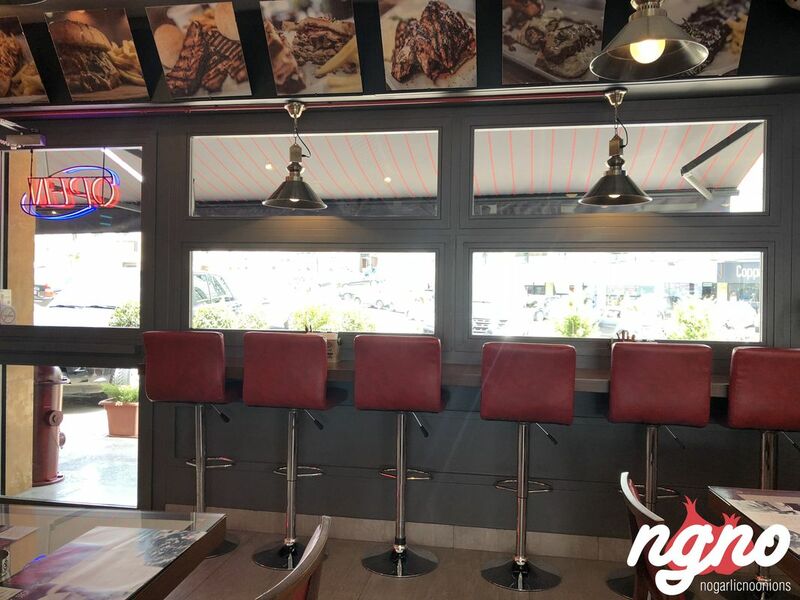 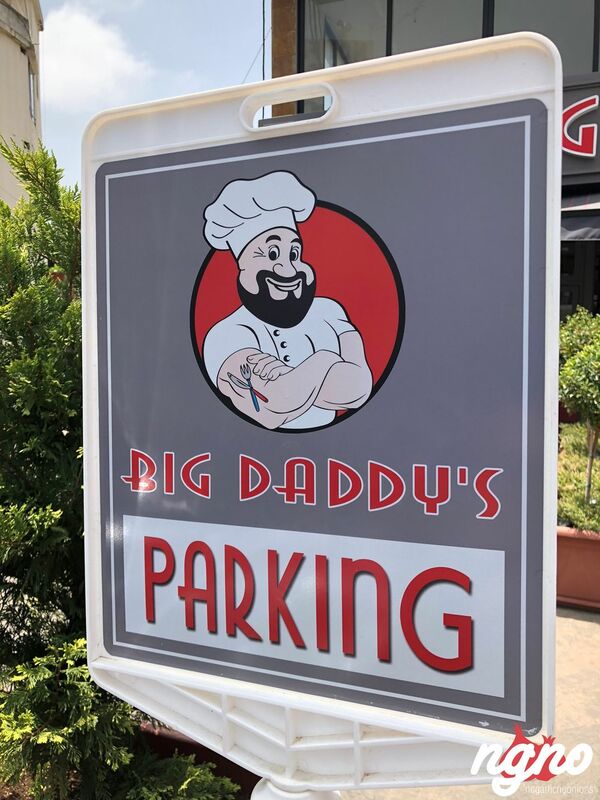 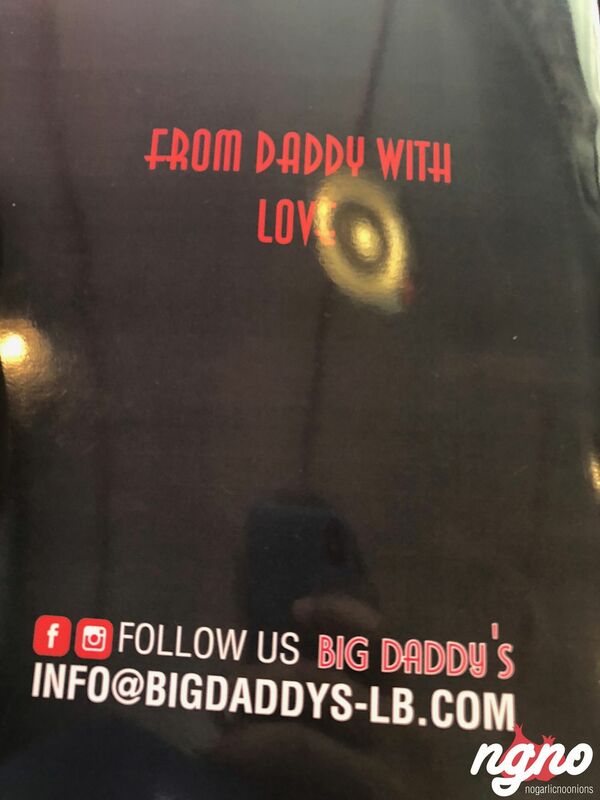 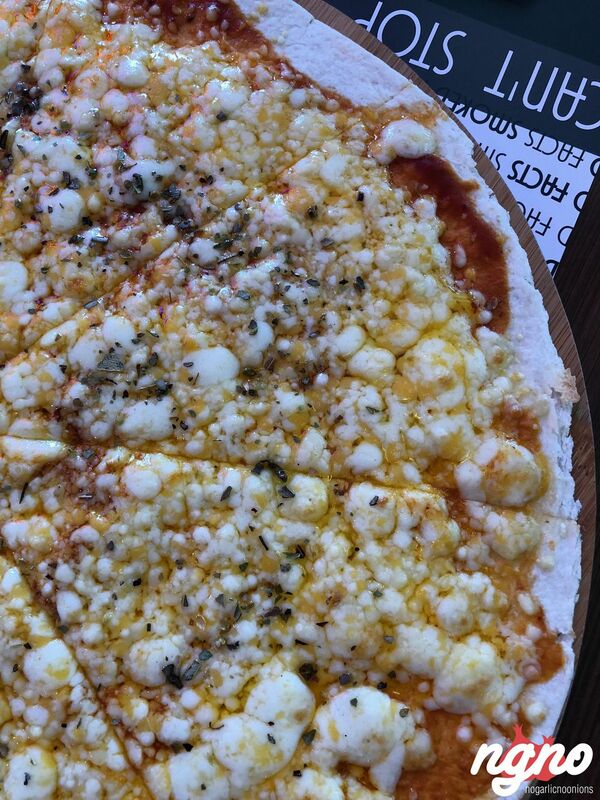 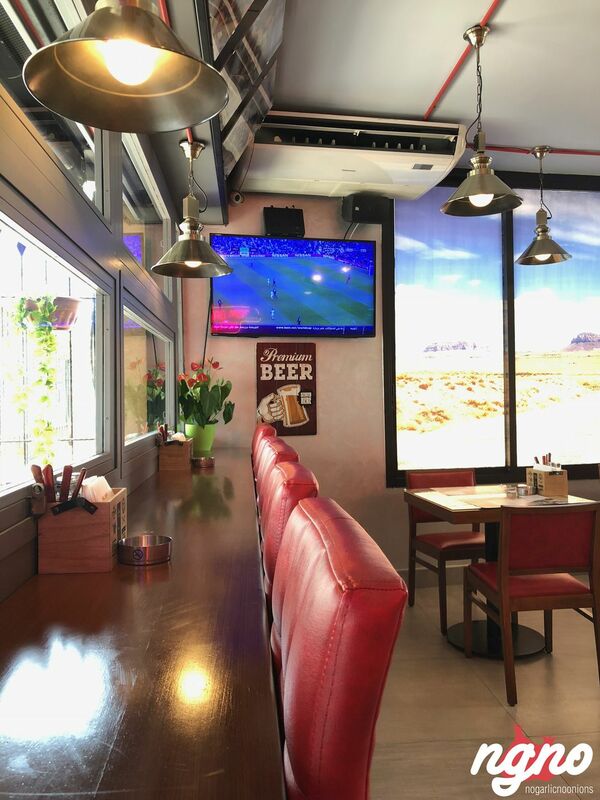 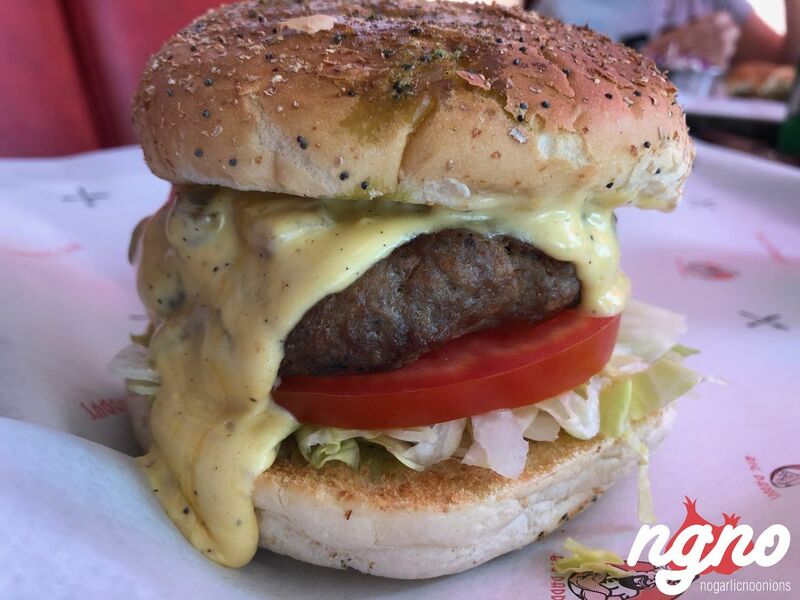 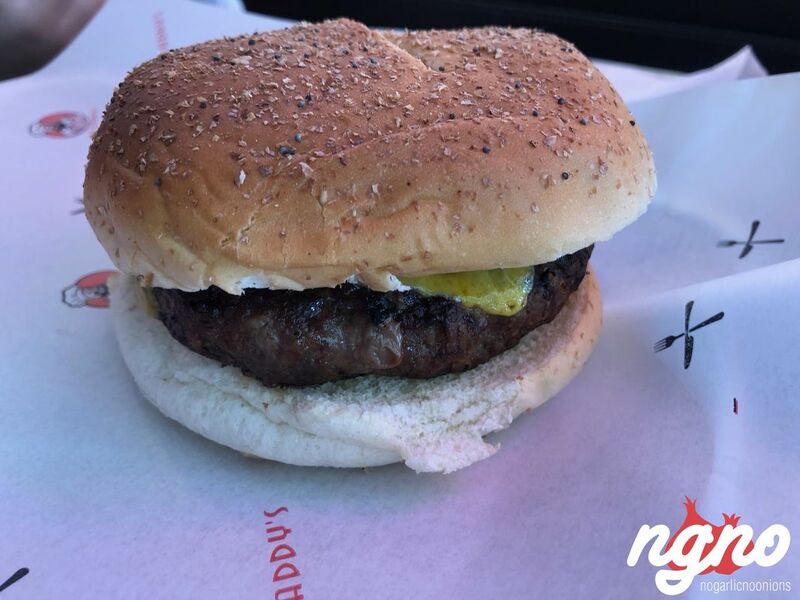 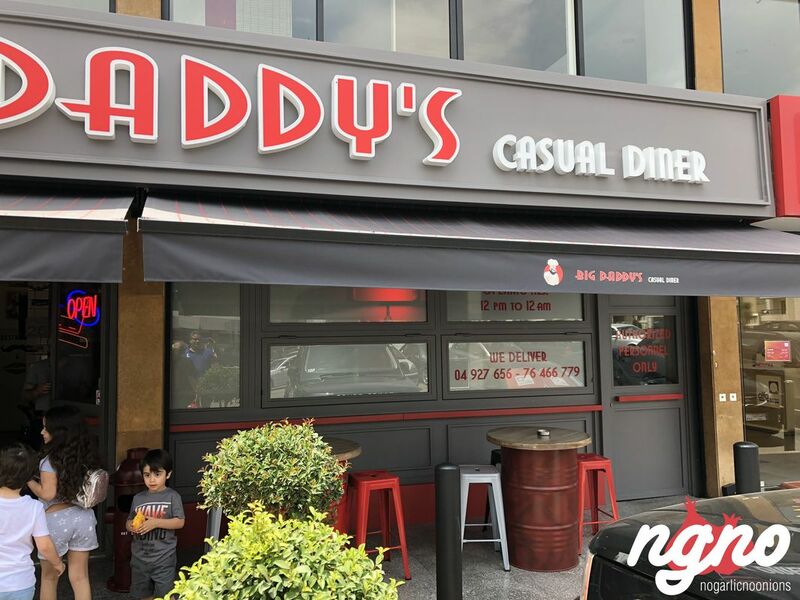 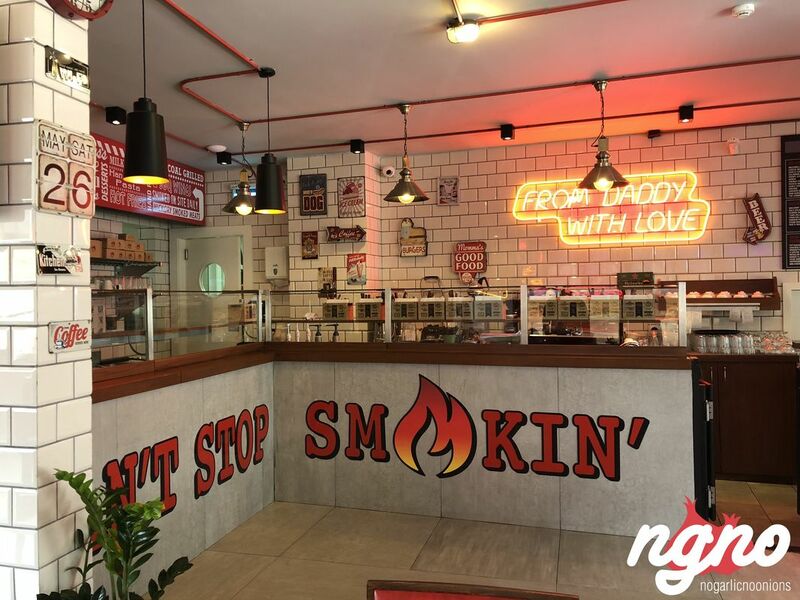 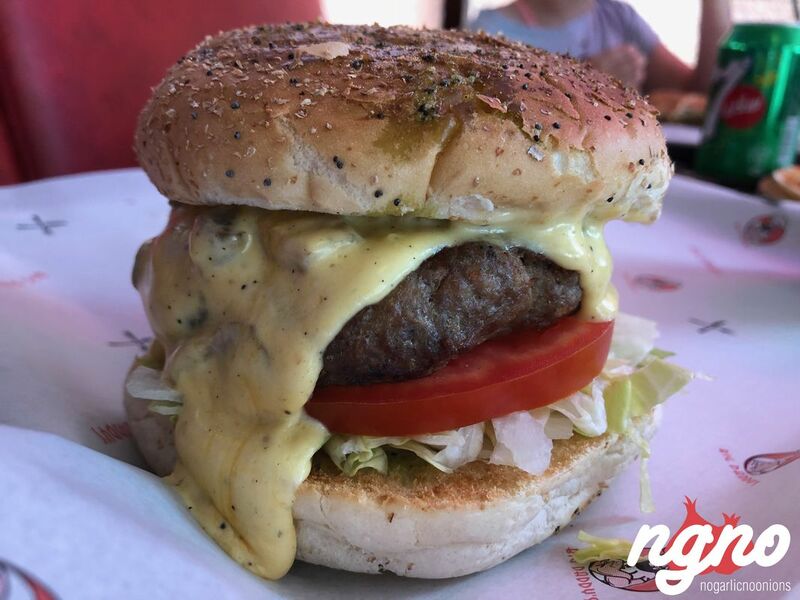 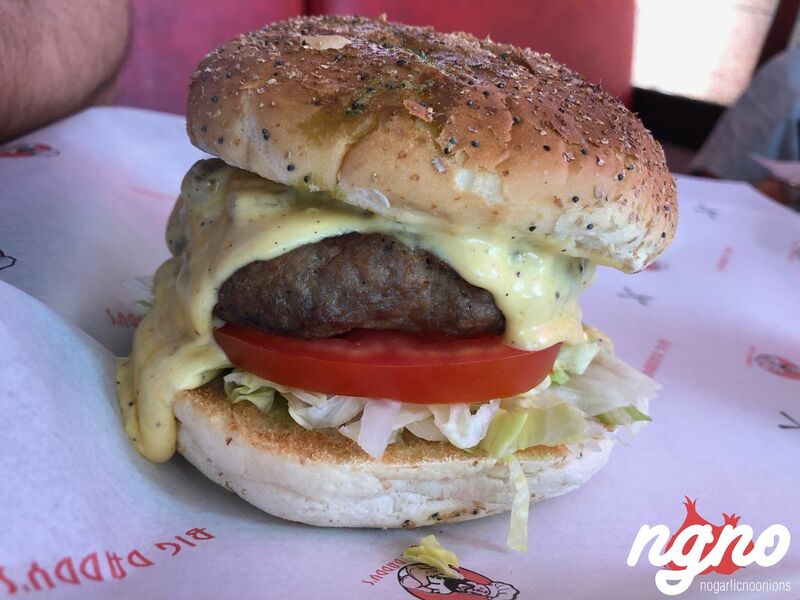 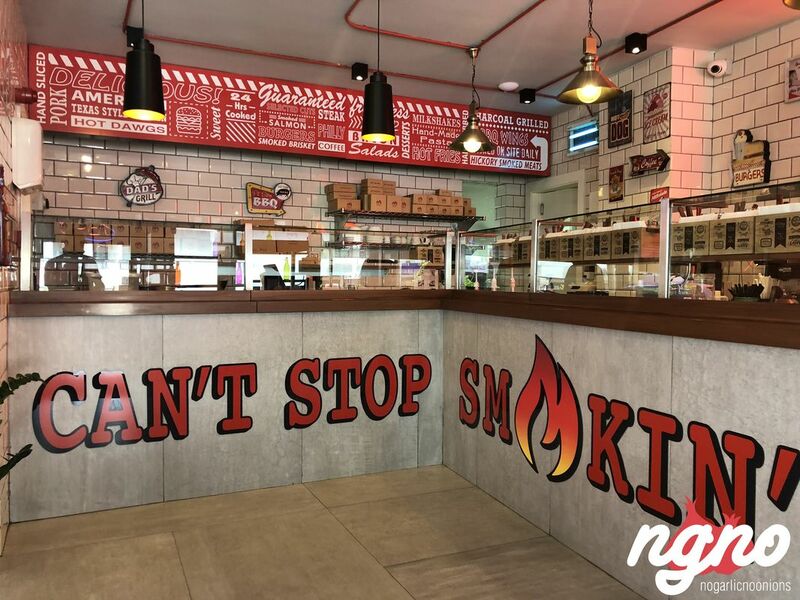 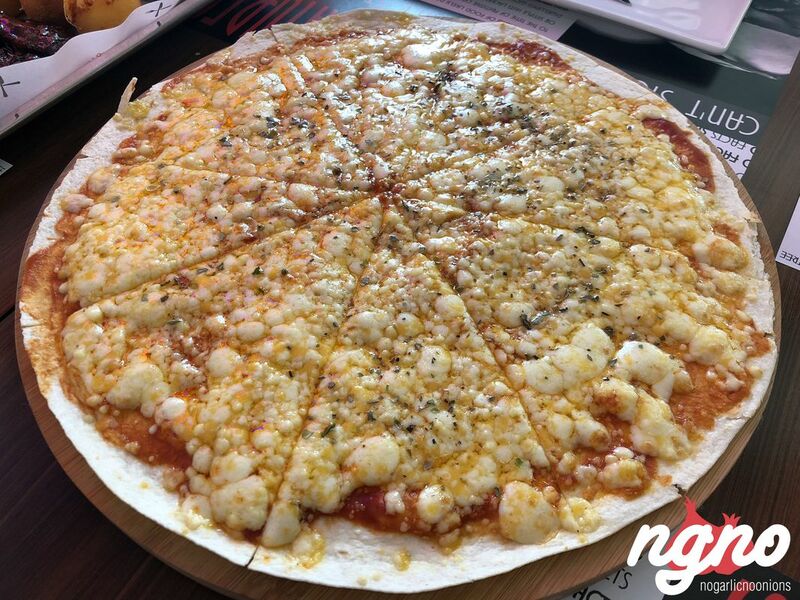 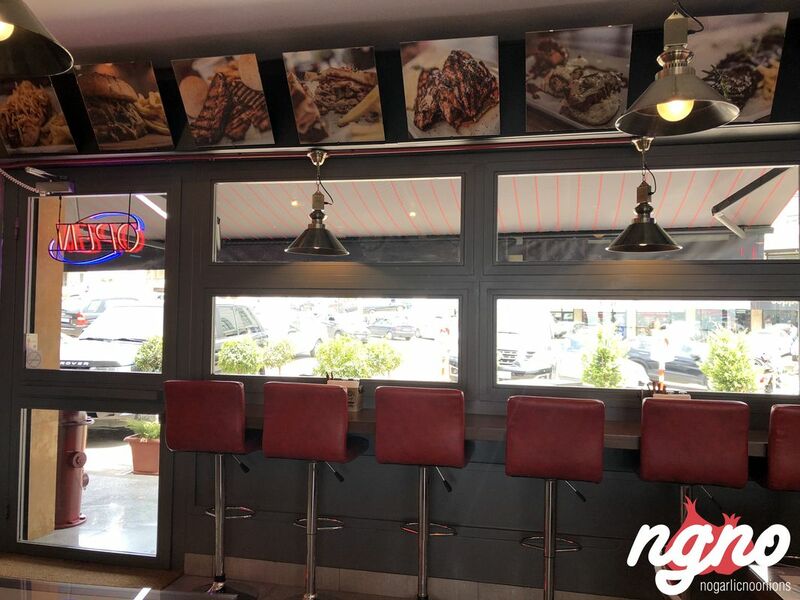 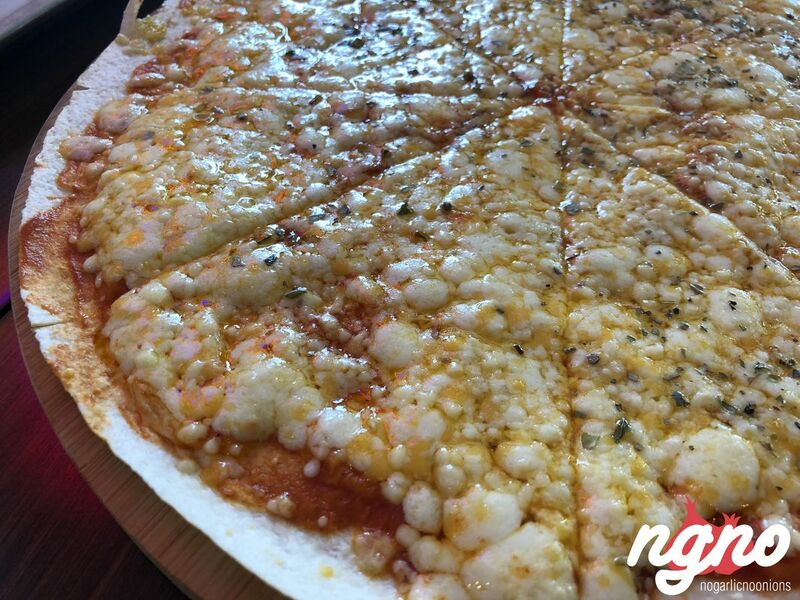 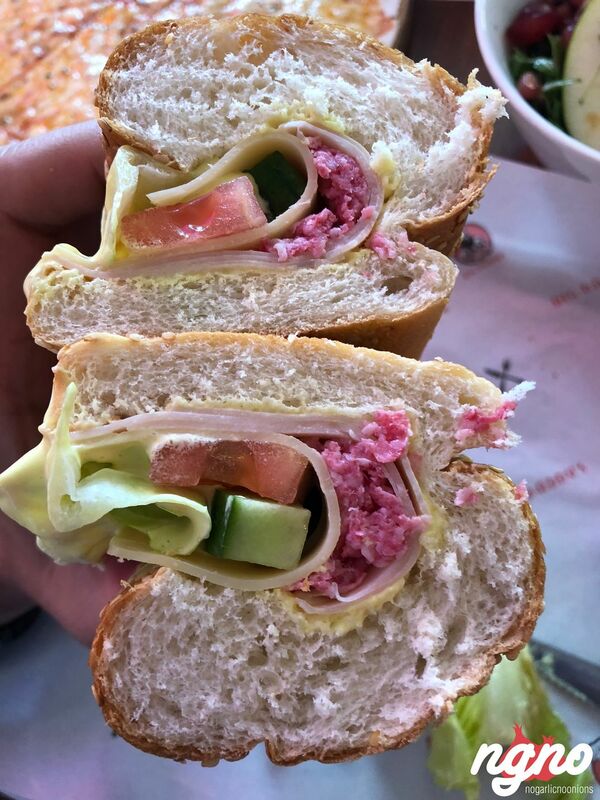 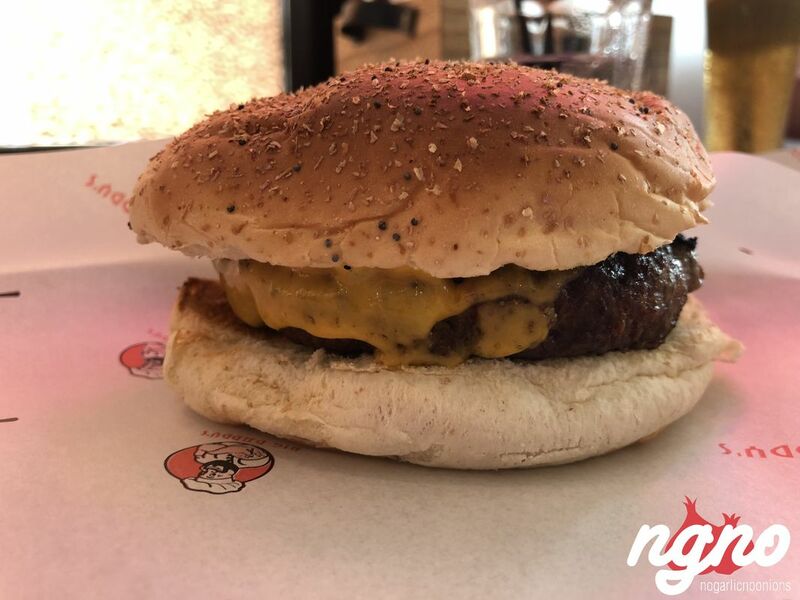 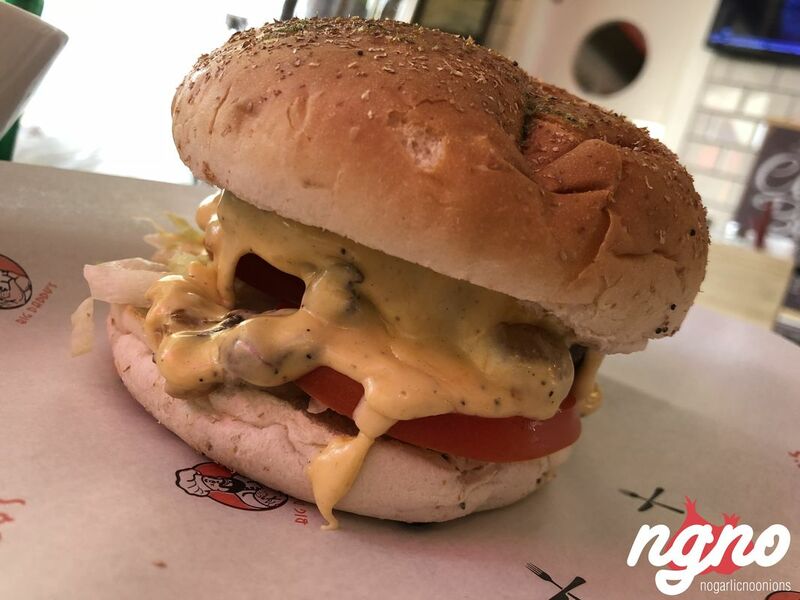 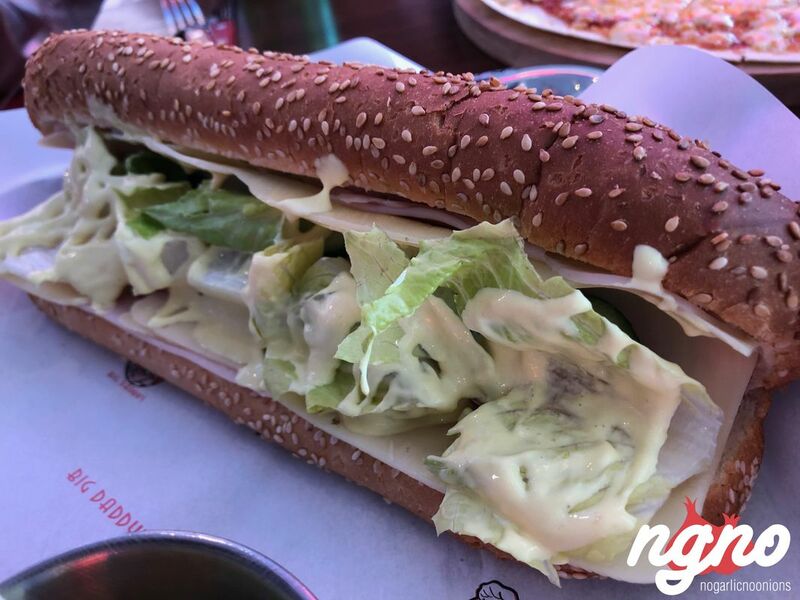 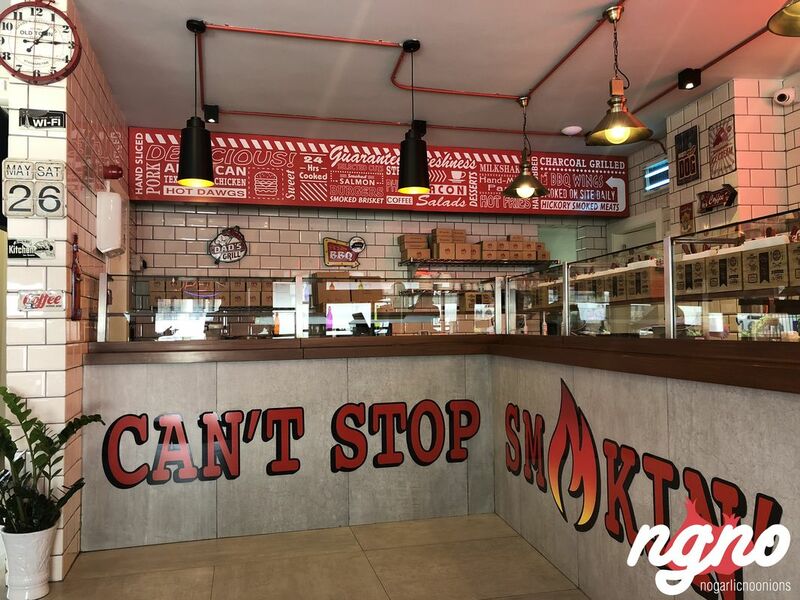 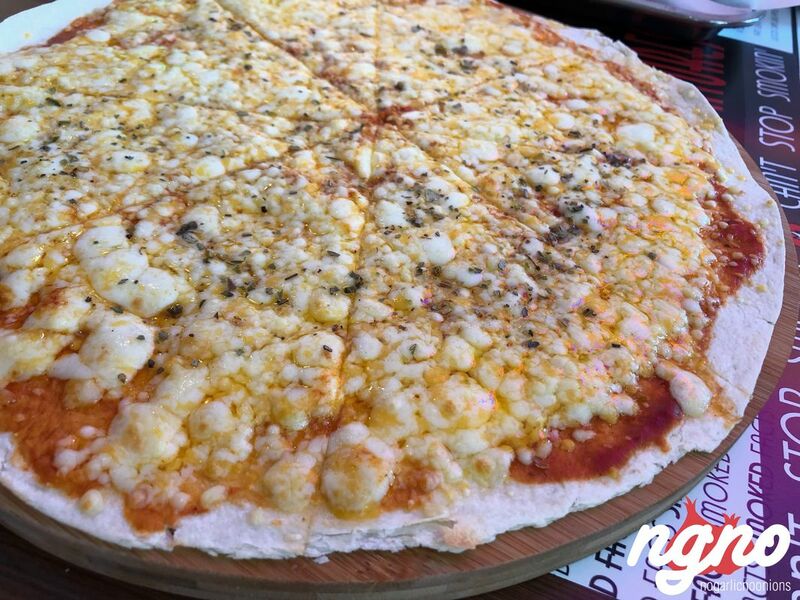 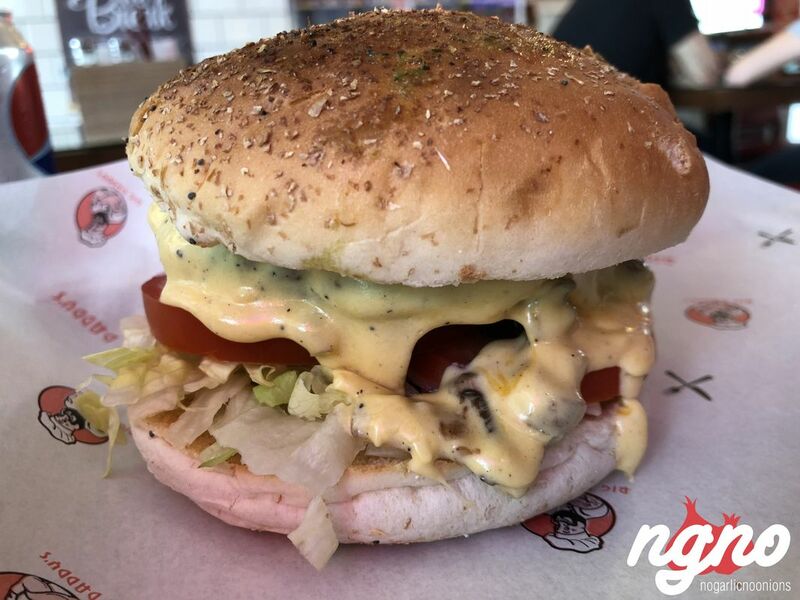 The Metn area welcomes a new diner: Big Daddy's.